Mississauga Mayor Hazel McCallion cheered at gala. Mississauga's mayor leaves office after 36 years. CBC News, Sep 27, 2014. "Hazel McCallion ... was toasted at a retirement gala, even though she insists she isn't retiring. 'I'm leaving my job as mayor of Mississauga - that's all,' the 93-year-old career politician told CBC News recently. 'I'm not retiring.' McCallion has held the top job in the southern Ontario city since 1978. Voters have since returned her to office 12 times. During two of those elections she ran unopposed and, even when challenged, McCallion often didn't bother to spend time or money campaigning. 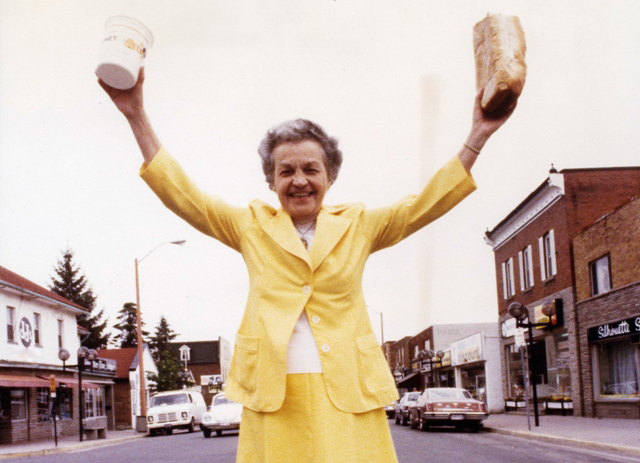 But after 36 years, Hurricane Hazel - as she's affectionately known - has opted not to run again." The Official Retirement Gala for Mayor Hazel McCallion was held at the International Centre in Mississauga, Ontario. Tickets cost $500 per person or $4,500 for a table of 10. Proceeds go to not-for-profit Hazel McCallion Foundation for the Arts, Culture and Heritage. Questions for Hazel. Interview 27 Sep 2014. CBC News Video, 16:44 min. Jean Chretien leads celebrity tributes to Hazel McCallion at retirement gala. Posted by John Stewart, Mississauga News, 28 Sept. 2014. 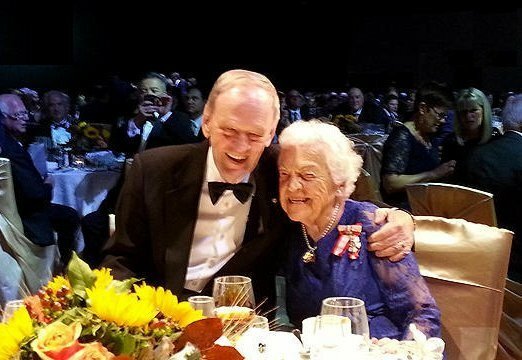 "The last mayor's gala of the Hazel McCallion era was held Saturday night before about 1,000 people at The International Centre ... Mayor Hazel McCallion was delighted when surprise visitor former Canadian Prime Minister Jean Chretien dropped by during Saturday night's Thank You Hazel Gala at the International Centre." "Surprise guest" - Photo by Fred Loek/Hazel McCallion Foundation. Multicultural Dance Mosaic at Hazel McCallion Retirement Gala at International Centre, Sept 27, 2014. YouTube video, 15:10 min. "I get to experience something new." Celebrating 40 years of Mississauga. As the city marks its 40th birthday, Mississauga News takes a look at its past, present and future. Published September 25, 2014. ● Welcome to 1974 by Louie Rosella, Mississauga News: "MISSISSAUGA - Hazel McCallion was a City councillor. Square One had a Woolco. There were five traffic lights on Hurontario St. between Lakeshore Rd. and Derry Rd." ● Mississauga 101: A variation on the Big Bang theory by John Stewart, Mississauga News. Published September 25, 2014. "Sometimes, the significant people and events seem to intersect at a particular moment in time. Call it the Big Bang theory of civic evolution. 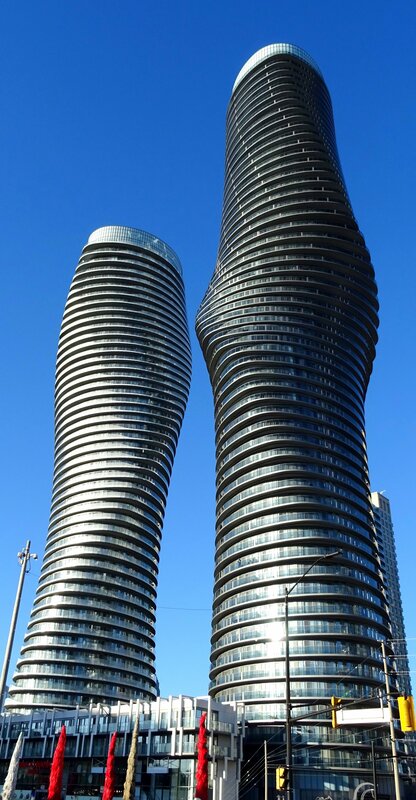 Mississauga is a fine example. If you were to pick a single moment that, in retrospect, best stands for how the city defines itself, it would almost certainly be 11:56 p.m. Nov. 10, 1979. That's when a CP rail train left the tracks near Mavis Rd., triggering the evacuation of half the city and placing a pugnacious, wily rookie mayor squarely in the headlights of the international media spotlight - where her mettle shone brightly. The train derailed and, at what seems in retrospect like the same milli-second, Hazel McCallion's mayoral status was fast-tracked to permanent." Salute to Hazel McCallion Press Conference Jake Dheer. Published on Sep 24, 2014. Jake Dheer invites people to the Community Tribute celebrations for Hazel McCallion, Mississauga Mayor for 36 years. The keynote speaker, Mayor McCallion, took to the podium to discuss Mississauga's changing landscape and her view of future potential and direction for Canada's sixth largest city. The event was attended by the Board of Trade executive and its members, business executives, city councillors, mayoral candidates and other politicians." Reverend Elvis and Daughter on a Mission of Peace from Newswire.ca. Mississauga, ON, Sept. 20, 2014 - "Reverend Elvis Bruce Sheasby and daughter Mary-Jane are flying from Calgary to Mississauga to sing 'You Are My Sunshine' to Mayor Hazel McCallion who is being honoured this Sunday [September 21, 2014] International Peace Day by Bruce's mother Dorothea Sheasby, the Canadian Registrar of World Citizens." See also: Reverend Elvis and Daughter on a Mission of Peace from Gateway Gazette, 24 Sep 2014. Reverend Elvis Bruce Sheasby: "I feel like we're sort of kindred spirits as the Elvis in me, like the Hurricane in Hazel, likes to shake things up! I've always admired Hazel's tenacity and vision. 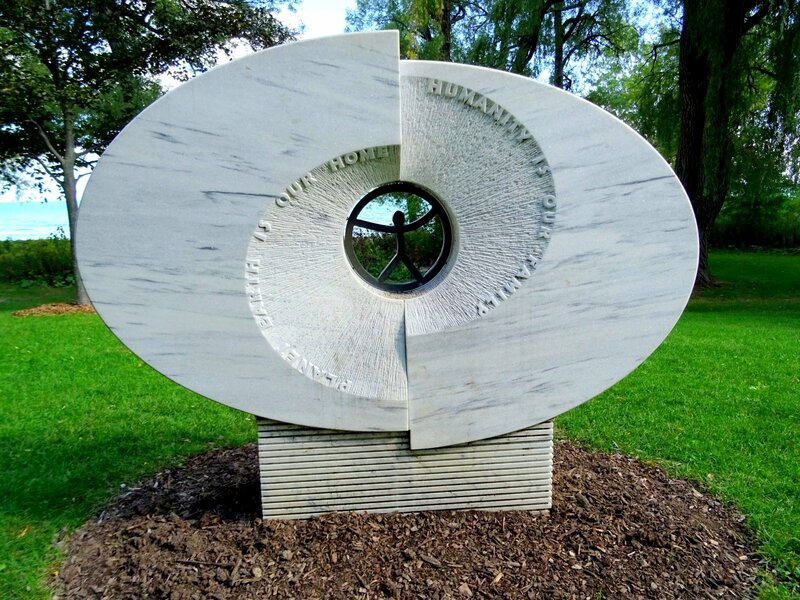 Hazel supported my mother in making this Peace Stone become a reality and I think that both women are a testament to the reality that Peace can be hard work and usually comes with a price." 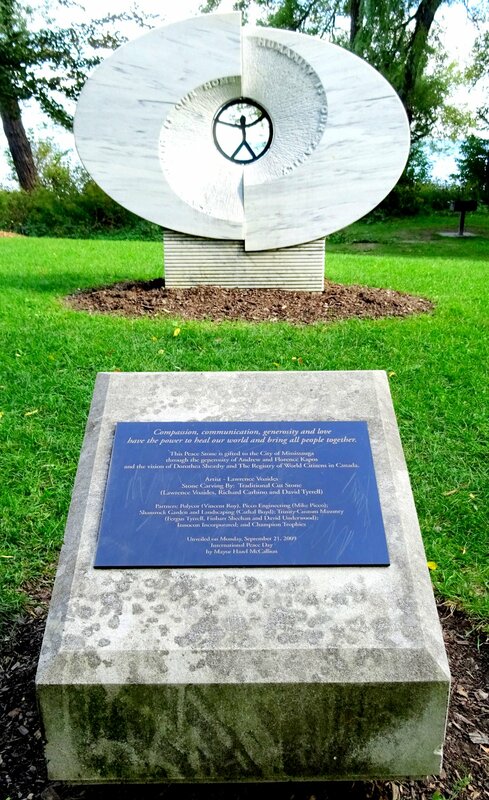 See Photo of Peace Stone below. 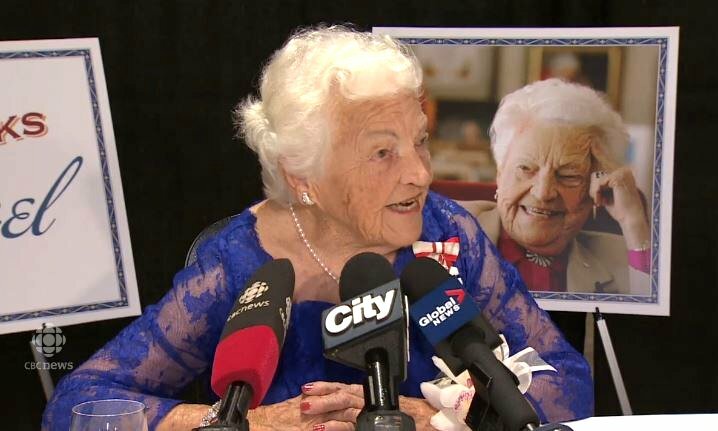 Proper sendoff planned for Mayor McCallion at LAC next month from Mississauga News. Mississauga Board of Trade to Host Mayor's Annual Luncheon - Hazel McCallion's Final State of City Address. Press Release, September 15, 2014. "For four decades, Mayor McCallion has been our city's number one ambassador and champion for business," says Sheldon Leiba, MBOT President. "The large, thriving and leading economic centre that Mississauga is today is a result of her leadership and commitment to creating a strong economic base." Mississauga Board of Trade (MBOT) will be hosting the 2014 Annual Mayor's Address Luncheon on Tuesday, September 23, 2014, 11:30 a.m. to 1:30 p.m., at Mississauga Convention Centre, sponsored by MNP LLP. 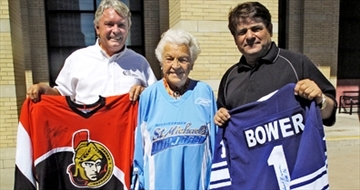 Mississauga Minor Hockey Associations to Celebrate Mayor Hazel McCallion. "The Mississauga Hockey League, Mississauga Girls Hockey League and Streetsville Hockey League will honour outgoing Mayor of Mississauga, Hazel McCallion, for her unwavering support for minor hockey in the community. On Saturday, November 29, 2014, the three associations will pay tribute to Mayor McCallion with a special ceremonial puck drop at the start of the MHL's annual Minor Novice Fun Day at Tomken Arena at 12 noon." Mayor Hazel McCallion saying Fairwell at the Southside Shuffle 2014. YouTube video, 8:20 min. Published on Sep 8, 2014 by Dave Parry. "On September 7th, delivered a speech to a huge crowd at the Southside Shuffle Blues Festival in Port Credit Ontario Canada. At 94 years of age she has been Mayor of Mississauga for 36 years and is retiring November 30th 2014. Everyone will miss her presence and everyone wishes her a wonderful retirement." Mississauga Transitway Phase 1. YouTube video, 1:52 min. Take a sneak peak of the Mississauga Transitway and hear from Mayor Hazel McCallion as we get set for service to start on Monday, November 17, 2014. The City of Mississauga is constructing Phase 1 of the Mississauga Transitway and four new stations at Central Parkway, Cawthra, Tomken and Dixie. Mayor Hazel McCallion's 33rd Annual Charity Gala Golf Tournament on Thursday, September 4, 2014 at BraeBen Golf Course, Mississauga, Ontario, Canada, sponsored by Paramount Fine Foods. 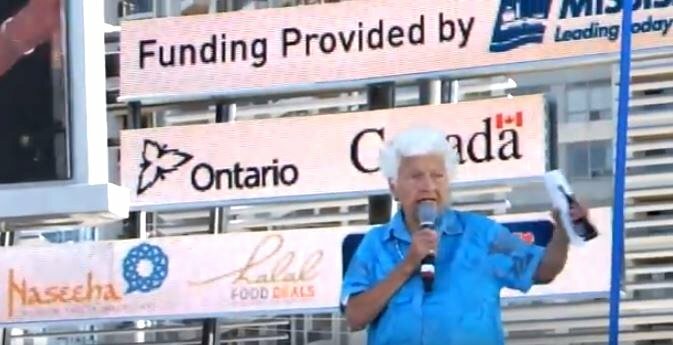 Message from Mayor Hazel McCallion: "Since this tournament started 32 years ago, more than $3 million has been raised to help more than 300 local charities, mostly organizations that provide support, encouragement and opportunities for children and youth in Mississauga ... Tournament founder John Rogers and Ron Lenyk have chaired the 33 tournaments between them with John leading the first 23 ... Being the mayor of Mississauga has been a privilege for me. Nothing has proven more rewarding than being able to provide financial assistance for the young people and charities of Mississauga because of the involvement of unselfish golfers and sponsors like you." 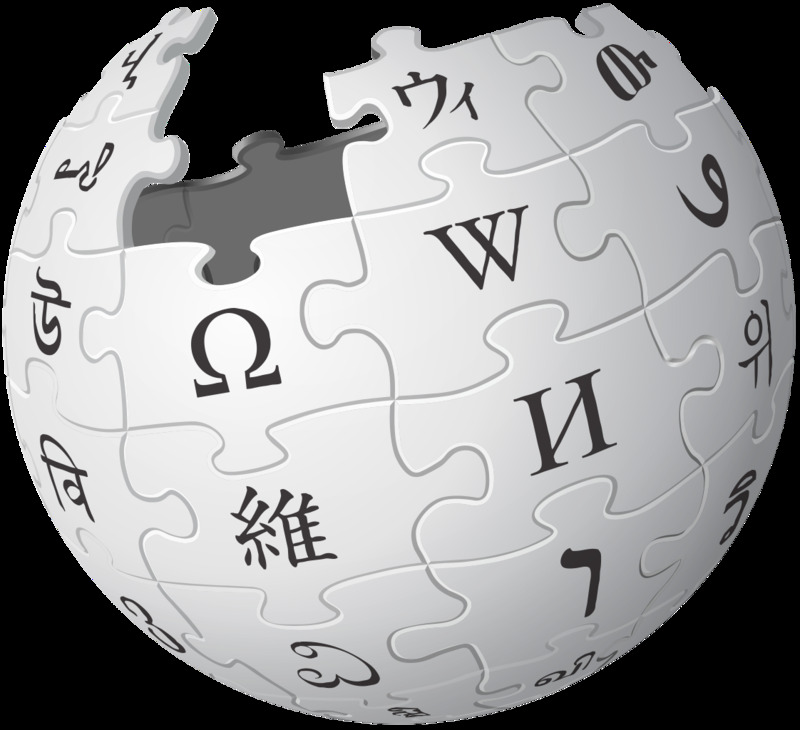 (Broken link removed 25 June 2016). ● Mayor Hazel McCallion's 33rd Charity Golf Tournament. Posted on Facebook by Photo Booth GTA. Photos taken at BraeBen Golf Course, 5700 Terry Fox Way, Mississauga, ON L5V 2W2 Canada. ● It is with great regret to inform you that Ron Lenyk passed away on September 14, 2015. See Ron "Zenko" Lenyk, Obituary. 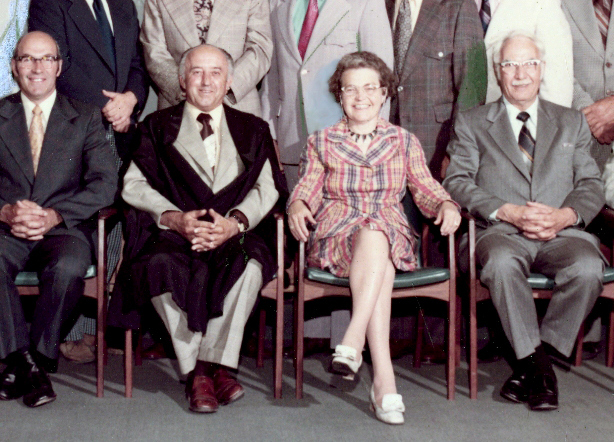 History lessons - a conversation with Hazel McCallion, Mayor, City of Mississauga. YouTube video, 20:06 min. Brian Lambie, President of Redbrick Communications, sits down for a conversation with Mississauga Mayor Hazel McCallion at the Association of Municipalities of Ontario's (AMO) Annual AGM and Conference in London, Ontario on August 19, 2014. Hear Hazel's thoughts as she looks back on her more than 40-year run in municipal politics. Jim Tovey pays tribute to Mayor McCallion at the Waterfront Festival . "Hurricane". YouTube video: 6:06 min. Comment by Gord MacDonald: "Ata Boy Jim. You might put the politician into the rock n roller but you'll never get the rock n roller out of the politician. Still got the moves."? Canada Day 2014 with Mayor Hazel McCallion. YouTube video, 4:48 min. Published on Jul 2, 2014 by WardOne Mississauga. "The last Canada Day with Mayor McCallion as Mayor." Hazel McCallion: 'For the parade to be named after me, it was such a big surprise and such an honour. Council endorsed it so I'm just delighted.'" Ms. McCallion usually disappoints those who ask after her diet - what secret elixir has warded off senility, which self-imposed restrictions have allowed her to work at the same pace she did half a century ago. She isn't on any medications, but takes iron supplements and fish oil caplets. She eats a lot of vegetables. The only leisure travel Ms. McCallion takes is for fishing trips ... Once, in Costa Rica, she caught a 110-pound sailfish." McCallion makes final bow at Bread & Honey by Joseph Chin, Mississauga News, June 5, 2014. 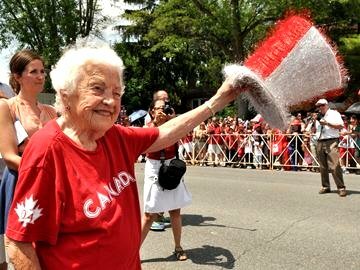 "Mayor Hazel McCallion ... leading the 2013 Bread & Honey Festival parade, appears at the popular event this weekend for the final time in an official capacity." 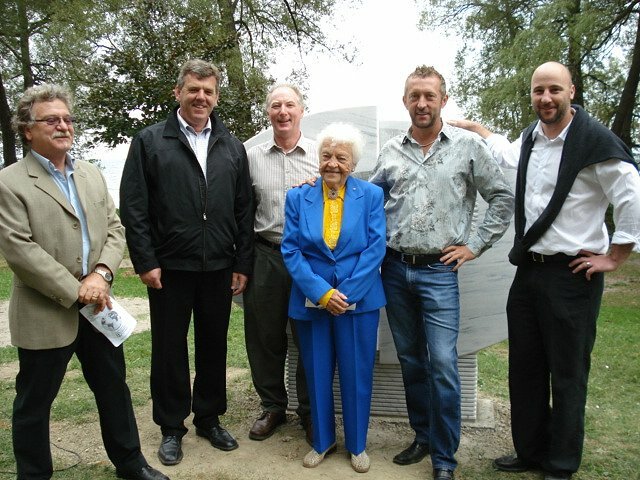 of Traditional Cut Stone Ltd.
and Mayor Hazel McCallion, circa 2014. 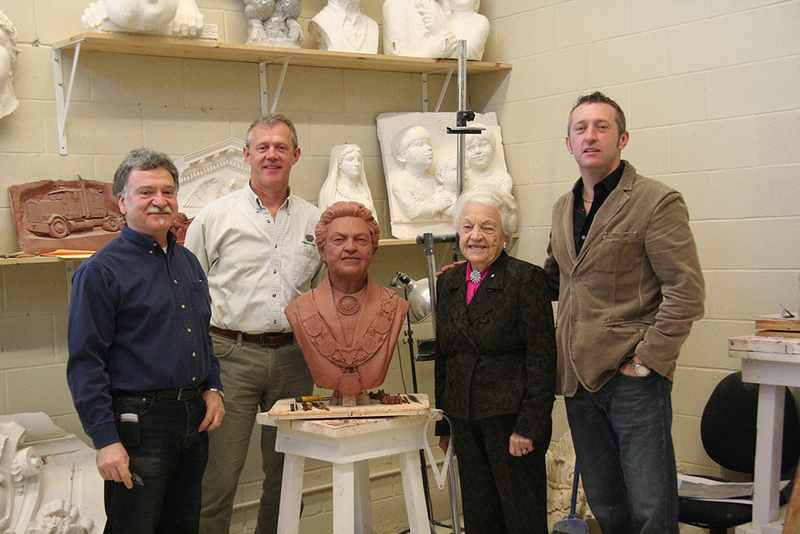 Photo credits: Traditional Cut Stone Ltd.
Mayor Hazel McCallion Interview Video. YouTube video, 21:30 min. Published on 15 May 2014 by TheRealEstateForums. "Interview with Mayor Hazel McCallion produced for the Land & Development Conference, May 13, 2014. Mayor Hazel McCallion first elected Mayor of Mississauga in 1978 and recognized as the longest serving Mayor in the City's history is serving her final term in office. She will discuss the evolution of Mississauga into the 6th largest city in Canada and the role that development played in reaching this notable achievement. We are honoured to give recognition and thanks to her enormous accomplishments and notable achievements in offices and to celebrate her remarkable contribution to public life." Message from Mayor Hazel McCallion on Provincial Election. YouTube video, 2:06 min. 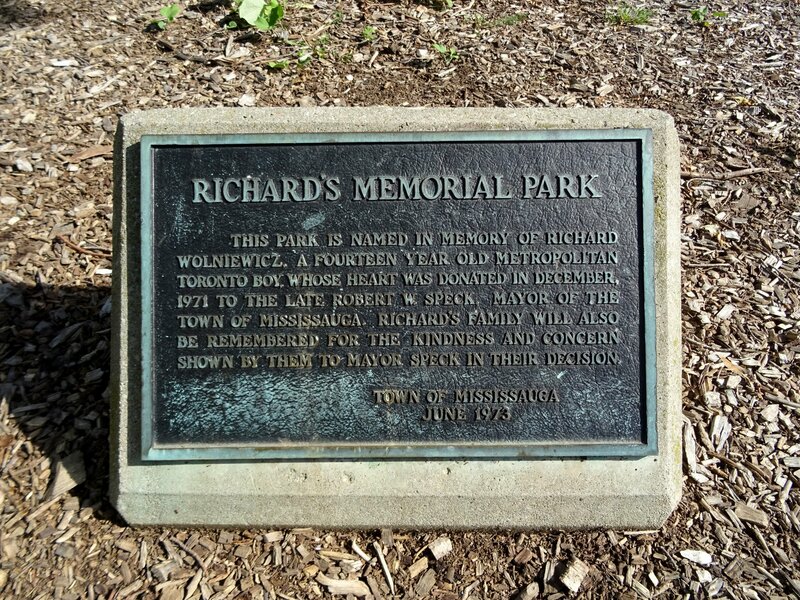 Published on 14 May 2014 by City of Mississauga. Mississauga Mayor Hazel McCallion Endorses Kathleen Wynne. YouTube video, 53 seconds. Published on 14 May 2014 by OntarioLiberalTV. Mayor Hazel McCallion to write memoir by Dianne Rinehart Book Reporter, Published on Mon May 05 2014. "Mississauga Mayor Hazel McCallion will publish her memoirs this October. Hurricane Hazel: A Life with Purpose will be published by HarperCollins, just as the mayor steps down from her job after 36 years. 'People have been asking me for years to write my autobiography and with the onset of my retirement I thought the time was right for me to share my life experiences and the lessons I've learned,' the mayor said in a news release. The 93-year-old, who before heading Mississauga's council was mayor of Streetsville (now part of Mississauga) in 1970, said she hopes her story 'will educate, entertain and inspire readers.'" Mayor Hazel McCallion to Volunteers: "Thank you! Thank you!" April 2014. YouTube video, 1:24 min. Published on Apr 24, 2014 by sq1oac2. " Still working full-time at age 93, the humorous Mississauga Mayor Hazel McCallion gives a short speech at the 21st Annual Volunteer Recognition Event at Square One Older Adult Centre on April 22, 2014. She asks: "How many of you in the room are over 93? How many of you are working? Who's working?" 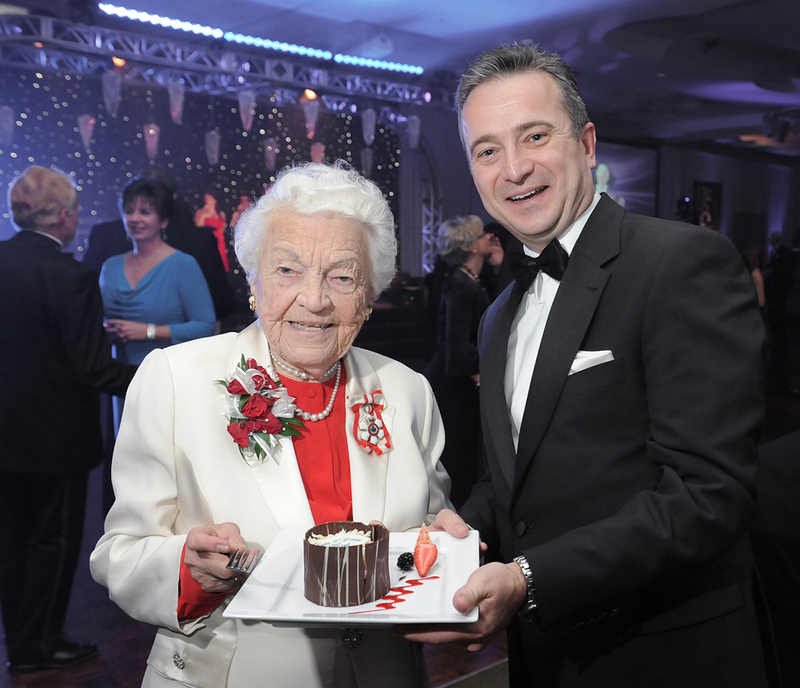 Tribute Dinner Raises $162,000, Pays Homage to Mayor Hazel McCallion. 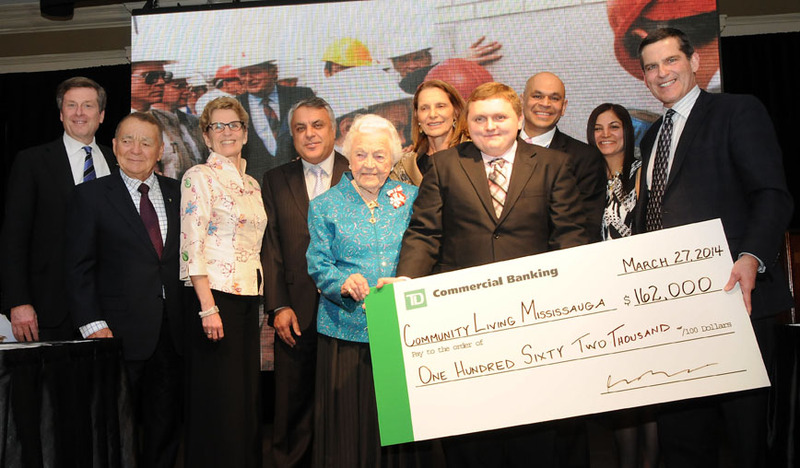 "More than 650 people raised over $162,000 while honouring Mayor Hazel McCallion at Community Living Mississauga's 30th annual Tribute Dinner on Thursday, March 27, 2014. The evening, themed "A Lifetime of Community Giving, Community Living", celebrated Mayor McCallion's contribution to the growth and development of Mississauga over the past four decades. 'This year marked the 30th anniversary of the Community Living Mississauga Foundation Tribute Dinner,' explained Jack A. Prazeres, Chair of the Tribute Dinner Planning Committee. 'To celebrate this milestone anniversary, it seemed obvious that we needed to honour the woman who has served as mayor during each and every one of those events.' The evening included remarks from Ontario Premier Kathleen Wynne, John Tory as well as video greetings from former Premier Bill Davis." 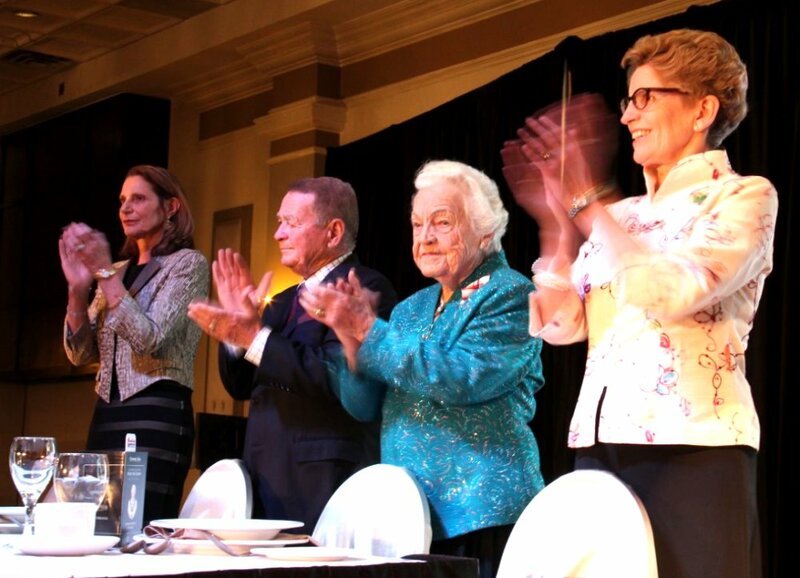 Tribute Dinner Raises $162,000, Pays Homage to Mayor Hazel McCallion. Mayor Hazel McCallion is honoured by Community Living Mississauga and spurs a record-setting fundraiser. Photos include: Didi and Ignat Kaneff, Honourary Co-Chairs, wth Tribute Dinner honouree, Mayor Hazel McCallion and Ontario Premier Kathleen Wynne. Photography by Mike Douglas, March 27, 2014, Mississauga Life: Spirit of the City. "Amongst the many causes that Mississauga's legendary Mayor Hazel McCallion has consistently championed over the years are the Carassauga Festival of Cultures and Community Living Mississauga (CLM). On March 27, these two outstanding volunteer organizations joined forces to pay tribute to their long-time benefactor at CLM's 30th Annual Tribute Dinner. The Mayor was honoured for the third time in her 36 years in office, and the air of mixed feelings was evident. There was a humorous celebration of a lifetime of achievements at the highest civic level, and also regret for the approaching end of a historic era. Proceeds from the sold-out dinner and fundraiser will enable children and teens with intellectual disabilities to actively participate in a variety of summer camp programs offered throughout Mississauga ..."
Photo by I Lee, 14 Feb. 2014. A Toast to Mayor Hazel McCallion on her 93rd Birthday 14 Feb. 2014. YouTube video, 5:33 min. Published on Mar 4, 2014 by bydewey1. "Mayor Hazel McCallion celebrates her 93rd birthday at Walden Circle Retirement Community in Mississauga on February 14, 2014. City of Mississauga Ward 2 Councillor Patricia Mullen joins Walden Circle President Rod Wilson and Marketing Manager Lana Madani to offer a toast to the Mayor." Wilson recalled McCallion attending the sod-turning ceremony of the facility a year ago. 'Hazel is a great supporter of seniors; she's a wonderful lady,' he added ... Fellow resident Frank Langdon: '(McCallion) does an admirable job,' he said. 'I'm amazed that she can do it at her age.'" 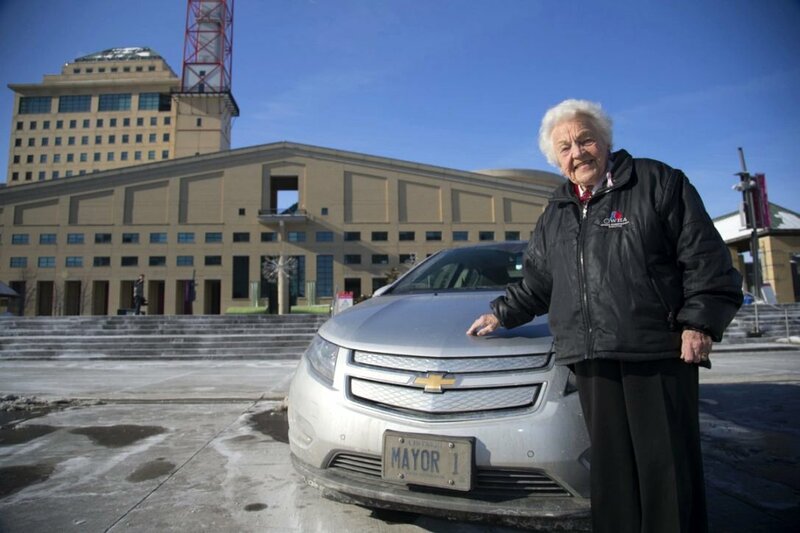 Mayor Hazel McCallion with her Chevrolet "MAYOR 1"
"At 93, dynamic Hazel McCallion is one in a million"
She wakes up every day at about 5 a.m. After getting out of bed she does exercises - stretches and flexes her muscles. She has a bowl of cereal while reading reports and communications sent home by one of her assistants. Her back-to-back meetings and events start as early as 7 a.m. and go as late as midnight. In a city of 750,000 residents, she reads every one of the dozens of emails and correspondence sent to her office every day." Hazel McCallion - Bio, Facts, Family | Famous Birthdays - Hazel McCallion, Politician from FamousBirthdays.com. Hazel McCallion Is a Member of: Famous Canadians, Famous Aquarius (February 14 Birthdays), Famous Politicians, Famous Hazels. Hazel, Hazel everywhere - plus a drop to drink by Joseph Chin, Mississauga News, Feb 14, 2014. "Political leaders come and go. Many, deservedly, are quickly forgotten. That isn't likely to happen to Mayor Hazel McCallion. 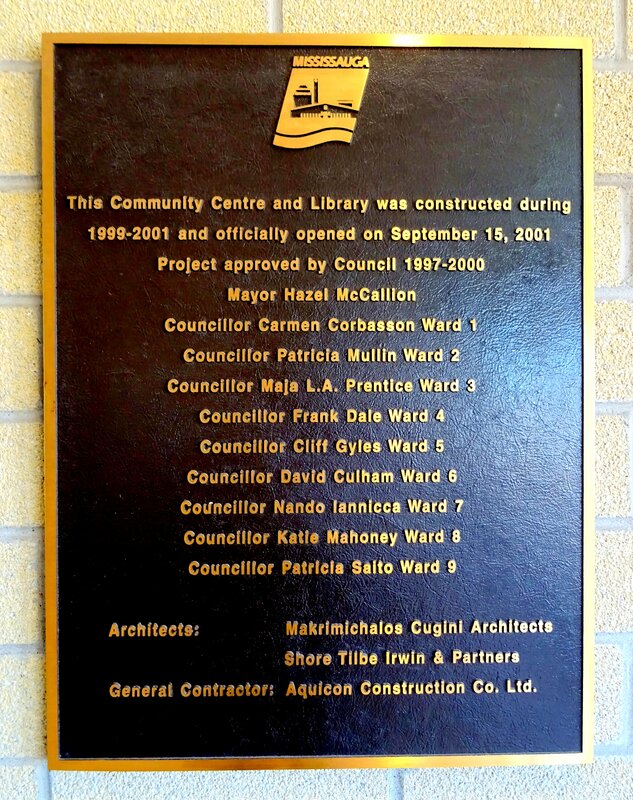 Much more visible reminders are the many physical structures bearing McCallion's name. At last count, they include an elementary school, university library, college campus, hospital wing, public walkway, a plethora of hotel halls and even a hydro substation. 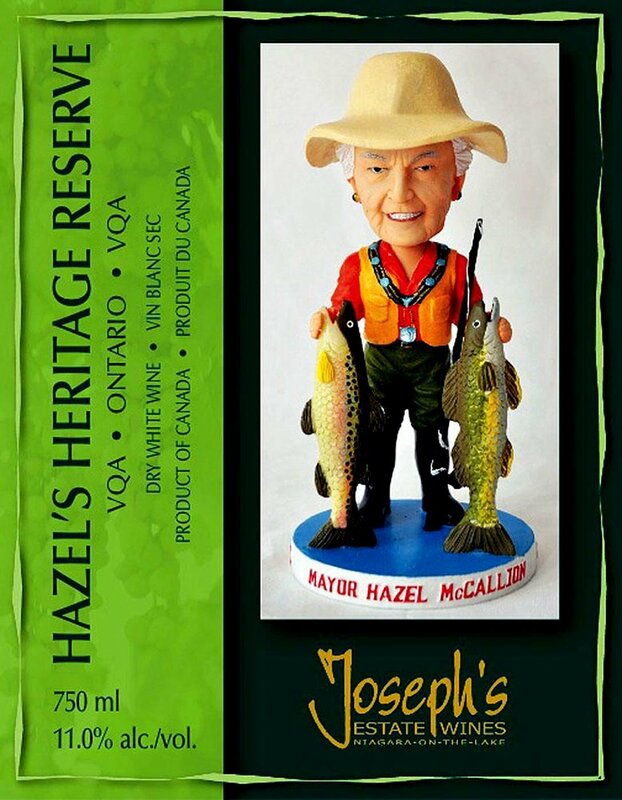 McCallion has been immortalized in drink - a vintage wine by Joseph's Estates Winery in Niagara-on-the-Lake ... Also, like many athletes, there's a McCallion bobblehead doll which depicts the mayor in full fishing gear with a fishing rod and two salmon. Although politically she's no shrinking flower, McCallion boasts a rose in her name. It's described as classic, versatile and vigorous, qualities that can, of course, be used to describe the mayor herself. It's also guaranteed to be disease resistant, mildew resistant and blackspot resistant, much like McCallion, who turns 93 today. The poem, titled Ode to Her Worship Hazel McCallion, was written by Councillor Bonnie Crombie who recited it at the Living Arts Centre on the occasion of the mayor's 90th birthday. The latest tribute ... is a limited edition coin commemorating her years in office. Only 3,000 lucky souls will own what may one day become a collectors item." Mississauga's people will be her lasting legacy: Hazel McCallion by Shawn Jeffords, Toronto Sun, First posted: Saturday, February 08, 2014 08:00 PM EST. "I'm a people's mayor. That's what I ran on. I ran on the platform of people's mayor and I've tried to fulfill that throughout the years. My legacy is to build a city for the people." 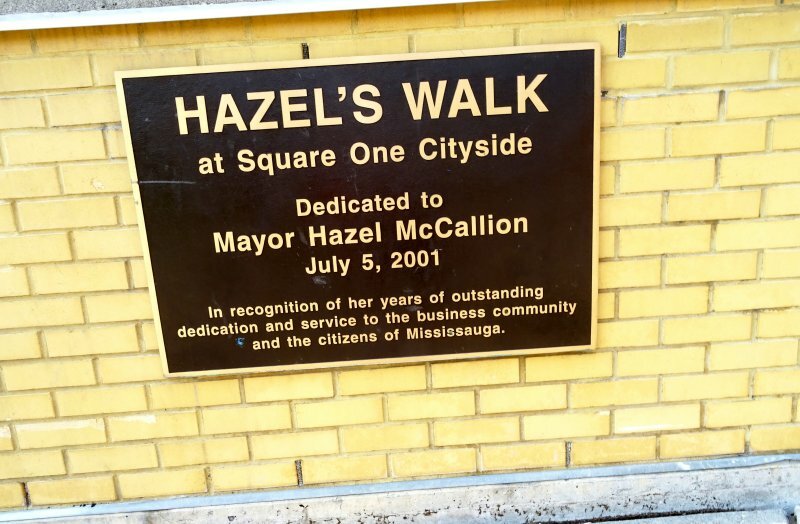 Legends Row: Hazel McCallion - Introduction Video for Harold Shipp. 2014 Induction Celebration. YouTube video, min. Published on Oct 2, 2015 by Mississauga Legends Row. The ceremony took place on Saturday, January 17, 2014 at the Great Hall, Mississauga Civic Centre. Rob Ford and Hazel McCallion Split-Screen GTA Mayor's Ice Storm Press Conference. YouTube video, 17:44 min. Published on Jan 17, 2014 by MISSISSAUGAWATCH. Splitscreen: Cam 2 Rob Ford. Cam 1 Hazel McCallion. Mayor Hazel McCallion reflects on achievements as she hosts her final New Year levee by David Paterson, Mississauga News, January 2, 2014. "Hazel McCallion meets citizens at her 35th New Year's levee, which was held in the council chambers at City Hall" ~ Staff photo by David Paterson. "McCallion has said she will retire after the municipal elections in October, bringing the curtain down on an astonishing career and an entire era in Mississauga politics. McCallion's arrival was sounded by a bagpiper and, as she entered the hall past an honour guard from the Knights of Columbus, she was greeted with enthusiastic applause from a crowd that numbered several hundred. 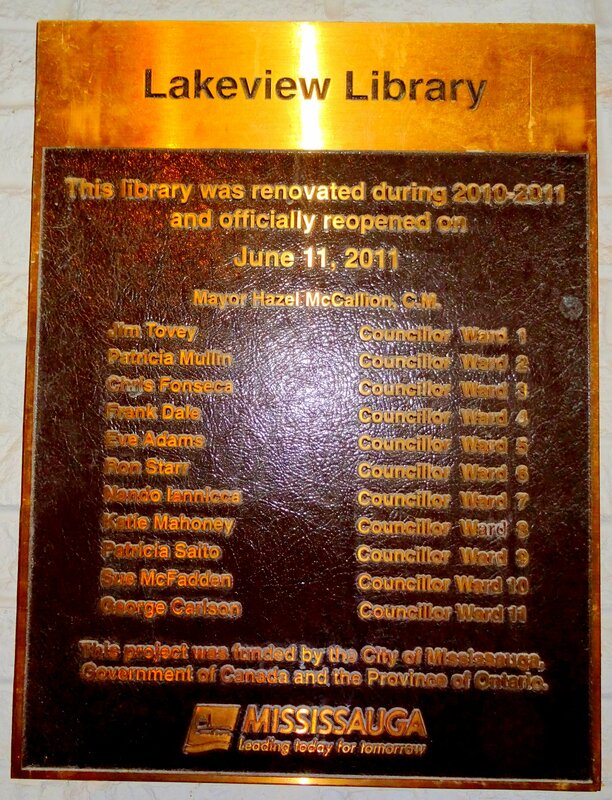 The mayor then recounted some of the achievements of the past four decades, ranging from the building of local libraries and community facilities to the opening of the Living Arts Centre and the Central Library ... regardless of who wears the mayor's chain at next year's levee, McCallion will be one tough act to follow." Hazel McCallion (almost 93) skates at 2014 Mayor's New Year's Levee. YouTube video, 2:07 min. Published on Jan 1, 2014 by MISSISSAUGAWATCH. "I've tried hard not to like her but can't. It's impossible to conclude that she's anything but GREAT. As in Unique-Great. Bigger balls than any male Canadian politician -- ever." This may not be the city that Hazel built, but there is no doubt it is the city she has ruled (benevolently, with the reverential blessing of the public every few years) for almost 35 years. People in other parts of Canada who know almost nothing about Mississauga know that we have a feisty little Tasmanian-devil-of-a-mayor named Hazel. In a 2011 profile of McCallion, The Globe and Mail declared that, "Hazel McCallion has been the subject of a political personality cult that dwarfs nearly any other in Canadian history." Hazel McCallion awarded $170,000 in dismissed conflict case by San Grewal, Urban Affairs Reporter, Published on Thurs Oct 24 2013 in the Toronto Star. "The decision in the case cannot be appealed." Who's After Hazel McCallion? By Ashley Newport on October 16, 2013. "Hazel McCallion's reign hasn't been problem-free, but it hasn't exactly been wrought with controversy either. She was first elected mayor in November of 1978 (before some of you fine readers were even born!) and has held onto her suburban throne in every election since. Known for her strong fiscal management (she kept the city debt-free for decades), the iconic mayor is not merely the city's leader - she's a central part of its identity. Ultimately, it'll be a tough transition for the city's future mayor. The new leader will have to, rightly or wrongly, come to bear the blame for some of Hazel's short sightedness regarding infrastructure. He or she will also have to win over a city that so loves its geriatric mayor that it has voted to keep her in power for over 30 years ..."
AVRO-Arrow - Mayor Hazel McCallion's speech welcoming the Arrow Home (Sept 28, 2013). YouTube video, 10:02 min. Published on Sep 29, 2013 by MISSISSAUGAWATCH. Split-screen video of Hazel McCallion's address at Mississauga Doors Open opening ceremony, September 28, 2013. Includes footage from CBC Archives: Avro Arrow's Maiden Flight, 1958. Where Does Hazel Fit In with the Big City Mayors? by Ashley Newport, August 18, 2013. Newport compares the mayors and lists misdeeds of each mayor, if any. ● 1. Toronto - Population of 2.615 million, Mayor: Rob Ford. ● 2. Montreal - Population of 1.649 million, Mayor: Currently Laurent Blanchard, formerly Michael Applebaum. ● 3. Calgary - Population of 1.096 million, Mayor: Naheed Nenshi. ● 4. 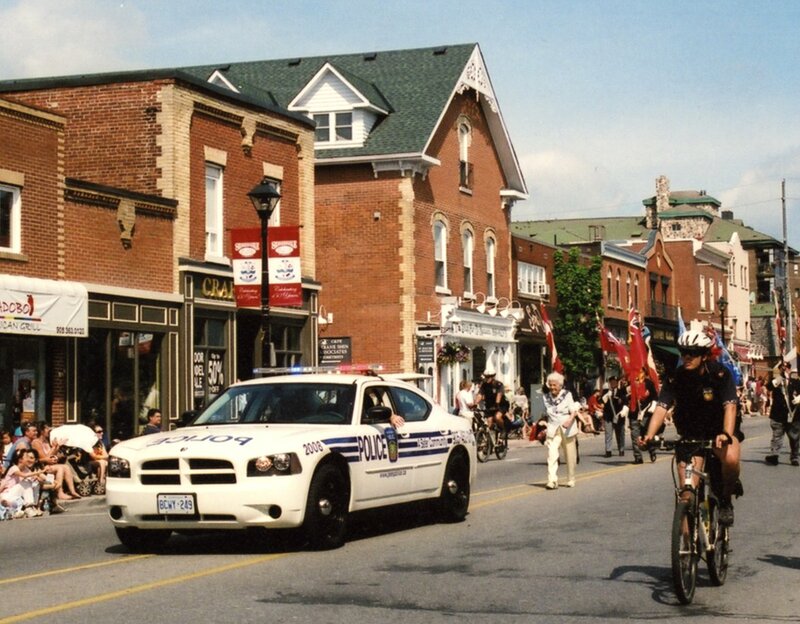 Ottawa - Population 883,391, Mayor: Jim Watson. ● 5. Edmonton - Population of 821,201, Mayor: Stephen Mandel. At this point, Hazel will leave office when Hazel is good and ready. She may not be as entertaining as Rob Ford, but she's got staying power (and bobbleheads)." Hazel McCallion lands the big one as Rob Ford and Italo Labignan cheer her on. YouTube video, 1:03 min. Published on Aug 16, 2013 by ItaloLabignan. 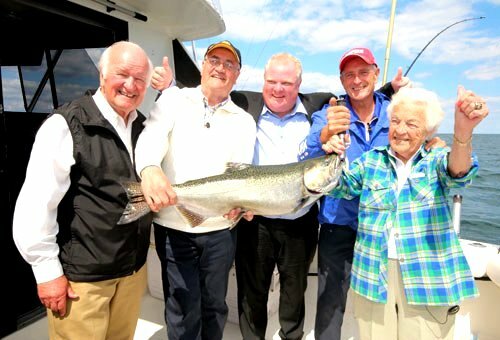 "Hazel McCallion, Rob Ford, Julian Fantino, Walter Oster, and Italo Labignan enjoy the day on the water when Hazel lands a HUGE Salmon!" FORD SAVES HAZEL! 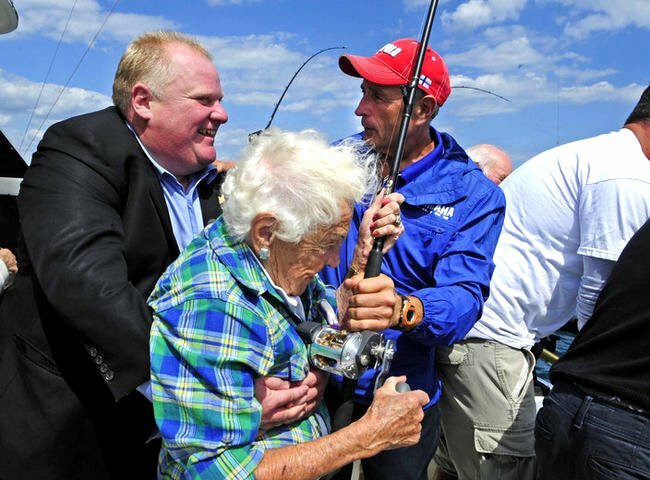 Rob Ford Saves Hazel McCallion On Fishing Trip!. YouTube video, 2:38 min. Published on Aug 17, 2013 by MississaugaWatch. "SLOW MOTION of original video 27.52% normal speed. Music by THE WHO. 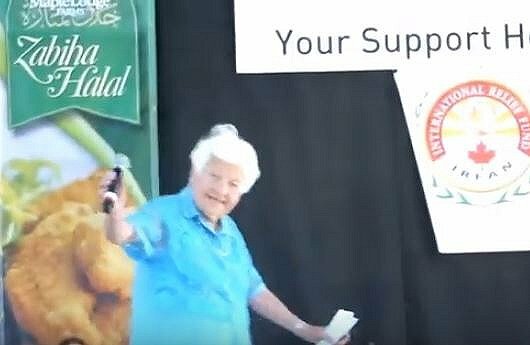 Original video: "Hazel McCallion lands the big one as Rob Ford and Italo Labignan cheer her on." See video below. Hazel recalls Rob Ford saving her with a 'bear hug'. Toronto Sun video, 1:57 min. Article and video by Joe Warmington, Toronto Sun, 28 March 2016. "Hazel McCallion will never forget the day that Rob Ford saved her from going for a swim in Lake Ontario while they were out on a salmon boat off Port Credit in 2013 ... 'There were two framed pictures,' said Hazel. 'One was of me with the fishing rod and Rob holding on to me and the other was all of us with the salmon.' But what had Hazel McCallion choked up was what Rob Ford hand wrote on the one of them: 'To the world's best mayor! Rob Ford xo.'" Note: Rob Ford, former Toronto mayor passed away on 22 March 2016 at the age of 46. 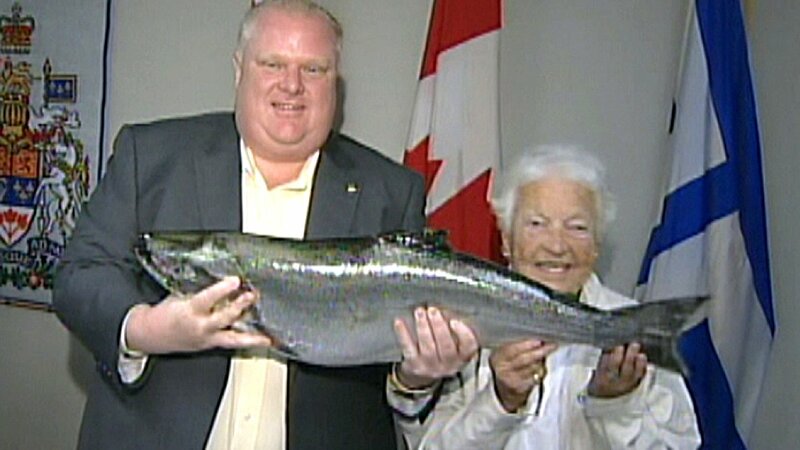 Rob Ford, Hazel McCallion go fishing. Hilarity, a kiss and a massive salmon ensue by Megan O'Toole, National Post, August 16, 2013. Photos: Rob Ford helps Hazel McCallion reel the fish in; Ford gives McCallion a celebratory peck on the cheek; the duo pose with the fish. "It took two mayors from the GTA's two largest municipalities Thursday to reel in the catch of the day: a massive, 16-pound salmon that threatened to drag Mississauga's 92-year-old chief magistrate overboard. 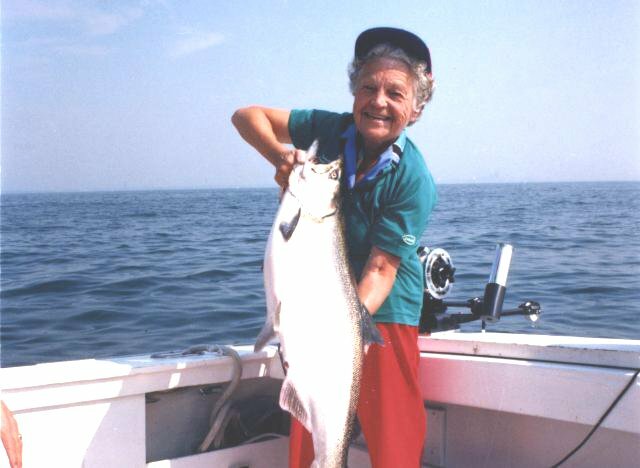 Mississauga Mayor Hazel McCallion and Toronto Mayor Rob Ford teamed up at the day-long Great Ontario Salmon Derby near Port Credit, eventually pulling in a massive chinook - but not before the fish put up a formidable fight." 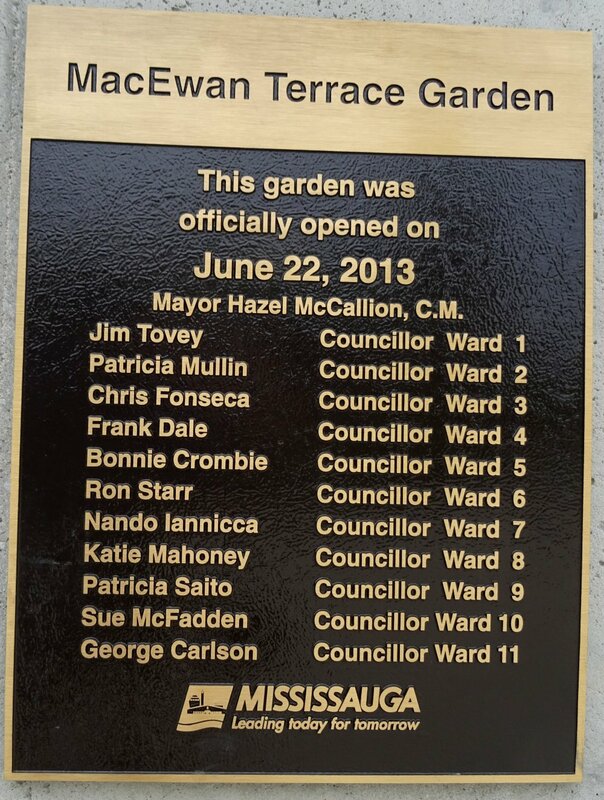 by Mayor Hazel McCallion, C.M. on June 22, 2013. Photo by I Lee, Aug. 26, 2015. Mississauga Mayor Hazel McCallion did not violate conflict of interest law: judge by Vidya Kauri, The Globe and Mail, Published Friday, Jun. 14 2013, 6:20 AM EDT. "Mississauga Mayor Hazel McCallion has been found not guilty of violating a conflict of interest law in a case that involved her son's development proposal for a downtown hotel. Superior Court Justice John Sproat, in a ruling Friday, dismissed an application by Elias Hazineh, who alleged Ms. McCallion broke the law in September, 2007, when she seconded a motion and voted for an amendment to a new by-law raising development fees." 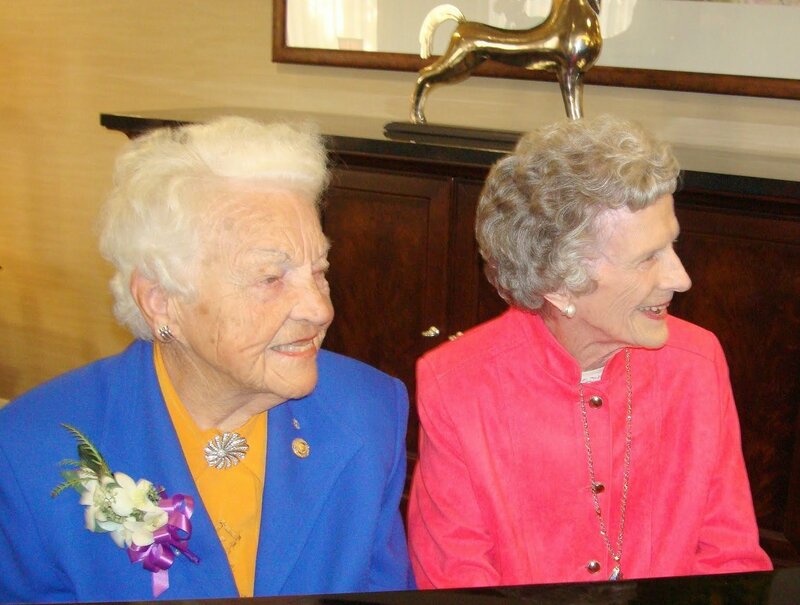 Hazel McCallion: I'm aiming for 100 by David Paterson, Mississauga News. April 28, 2013. 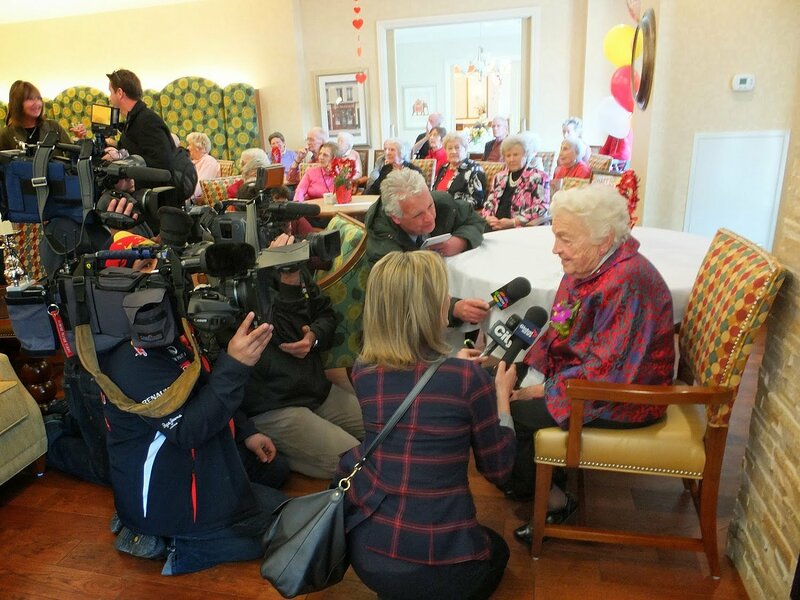 "Hazel McCallion was in ruminative mood at a belated birthday party thrown in her honour on Sunday, telling the 150 or so guests, "I'm hoping to maybe live to be 100, but you never know." ULI Toronto Fireside Chat with Mayor Hazel McCalliono. YouTube video, 1 hr. 29:10 min. Published on Feb 28, 2013 by Urban Land Institute Toronto. 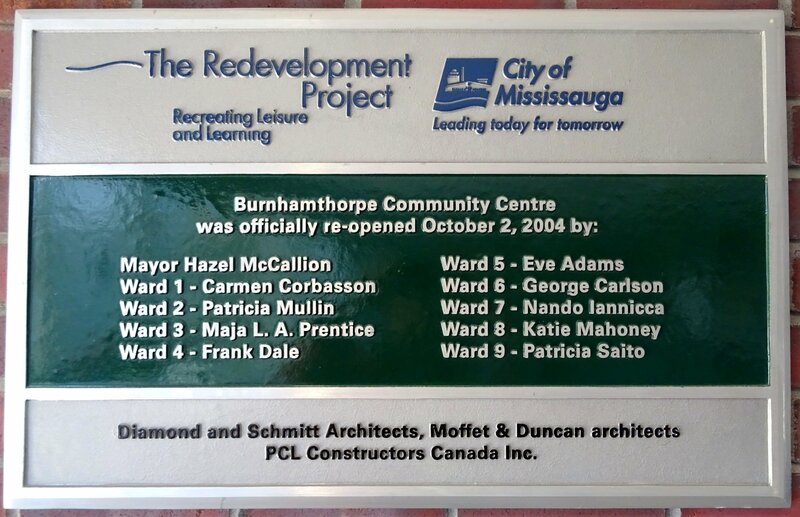 "Hazel McCallion was elected Mayor of Mississauga in 1978 and is currently serving her 12th term. She has been recognized numerous times for her contributions to public service and was inducted as a Member of the Order of Canada in 2005, honoured with a Lifetime Achievement Award by the Mississauga Board of Trade in April 2010 and in June 2010, was conferred with the Honorary Doctor of Laws degree by the University of Toronto. In addition, the Hazel McCallion Senior Public School, the Hazel McCallion Academic Learning Centre at the University of Toronto at Mississauga and the Hazel McCallion Campus of Sheridan College has been named in her honour. As the new Chief Planner of the City of Toronto, Jennifer Keesmaat is facing issues of growth and downtown development similar to Mississauga, yet on a different scale. Her experiences as a partner at the Toronto-based integrated design firm DIALOG, where she worked with many mid-sized cities to develop downtown, cultural and strategic plans before accepting the position of Chief Planner in September 2012, make her ideally suited for the challenge. Join us as Jennifer sits down with Hazel McCallion to discuss the mayor's career, her challenges and successes in city building, development and leadership, and her life lessons for the next generation." 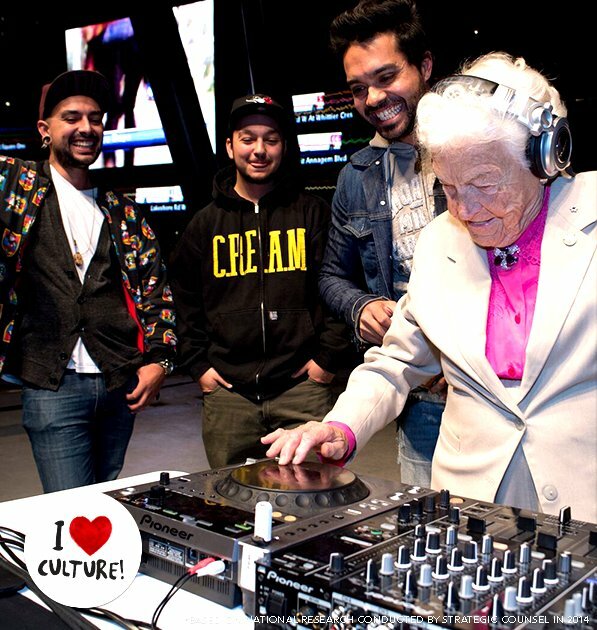 Hazel McCallion - Who says I'm too old? from The Mark of a Leader: The Stories We Tell - themarkofaleader.com. Hazel McCallion Campus - Mississauga | Sheridan. YouTube video, 2:06 min. Published on Sep 13, 2012 by Sheridan College. 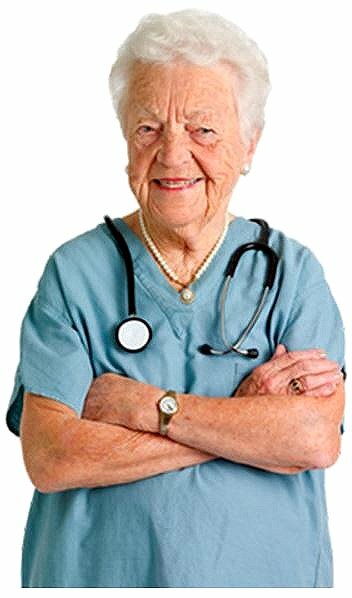 Information about Sheridan's new Hazel McCallion HMC - Mississauga Campus! Mayor Hazel McCallion speech at MuslimFest 2012. YouTube video, 4:09 min. Published on 10 Sep 2012 by sq1oac2. "But remember one thing ... Thank God for the many blessings that have been bestowed upon all the people in this great country of Canada. We have a situation far better than any country in the world - appreciate it, respect it, and support it." Mississauga's 91-year-old Mayor Hazel McCallion speaks to attendees of MuslimFest held at Mississauga Celebration Square, 300 City Centre Drive, Mississauga Ontario Canada, 1 September 2012. Hazel's Walk by Lesley, 11 July 2012. 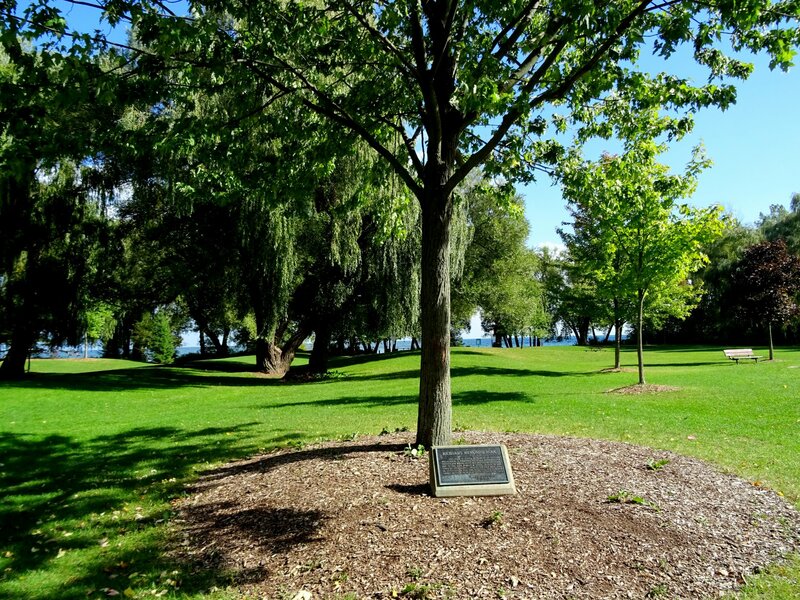 "Hazel's Walk is a curved path that runs along the cityside of the mall at Duke of York Blvd and is dedicated to and named for the Mayor on her 80th birthday. She is the longest serving mayor, having been elected in 1978, though she has said that she will not run in the next election in 2014, by which point she will be 93 years young!" Canada Day Mississauga Mayor Hazel McCallion. YouTube video, 0:27 min. Published on July 3, 2012 by travler2008. "Port Credit (Mississauga) Ontario Paint the Town Red Canada Day Parade with Grand Marshals Mayor Hazel McCallion and Canadian Football Hall of Fame's Chuck Ealey. 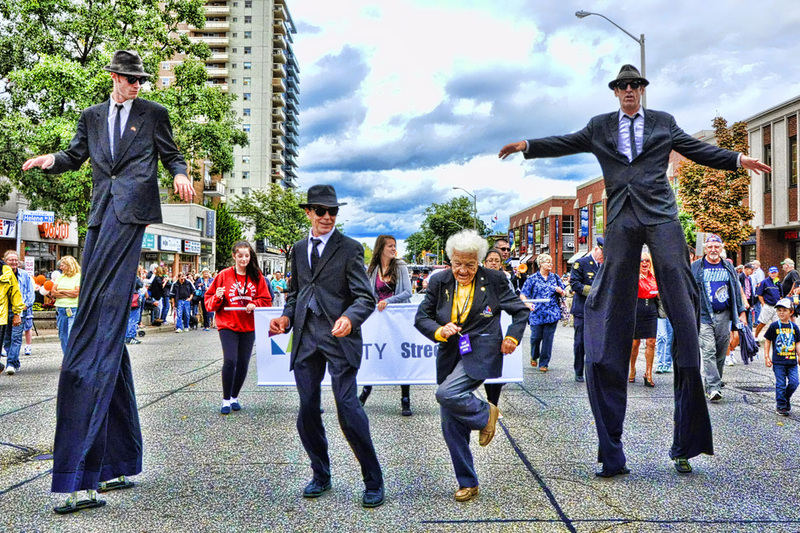 At the start of the parade, and to the delight of the crowd, Mississauga's 91-year-old Madam Mayor elected to walk the route along Lakeshore Road East in Port Credit." Mississauga - 1989 vs NOW. YouTube video, 14:16 min. Published on April 30, 2012 by STORECAST. "Oh how things have changed!" Driving south on Hurontario Street, from Brittania Road to Lakeshore Road in Mississauga, Ontario, Canada. Mississauga: Then and Now, Before and After. Music: "Now We Are Free" by Lisa Gerrard. 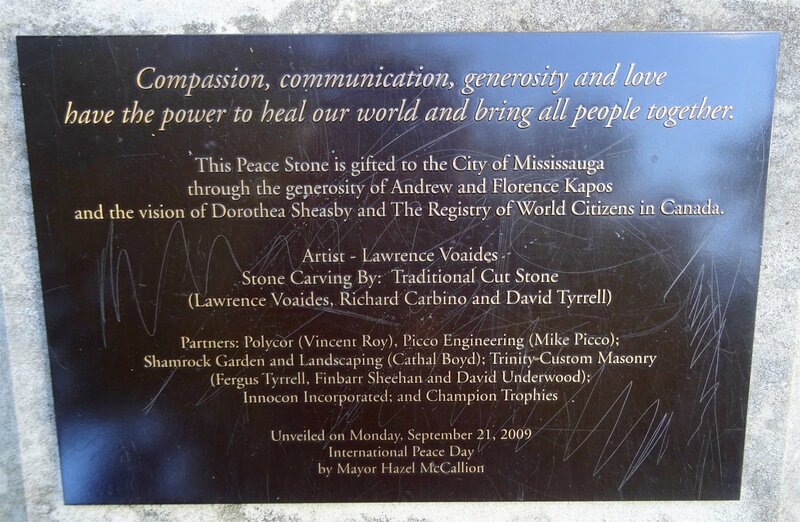 Keywords: Mississauga, Mississauga Celebration Square, Brampton, Toronto, Hurontario, Dundas Street, Burnhamthorpe, Square One, Brittania Road, Matheson Street, Peel, Peel Region, GTA, Greater Toronto Area, Ontario, Canada, Lisa Gerrard, Gavin Greenaway, The Lyndhurst Orchestra, Bruce Fowler, Yvonne S. Moriarty, Walt Fowler, Ladd McIntosh, Elizabeth Finch, Jack Smalley & Hans Zimmer. 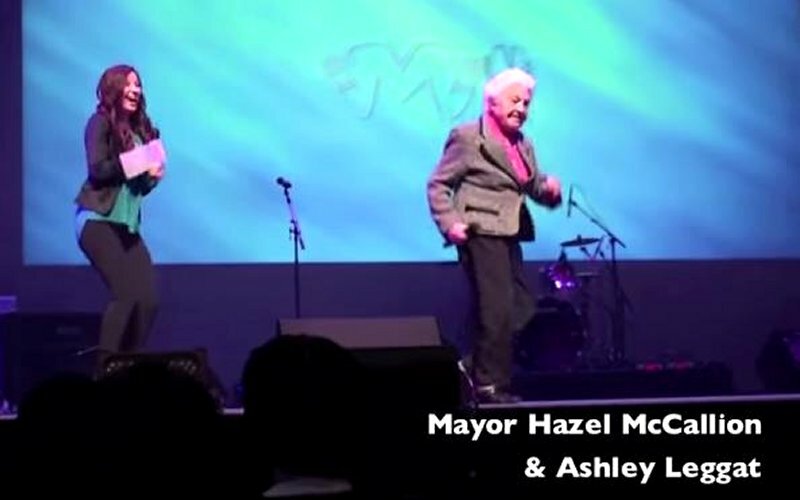 FUNNY CLIP: Mayor Hazel McCallion and Ashley Leggat at COUNT ME IN in 2012. YouTube video, 0:43 min. "Published on Jun 19, 2014. Hands down one of our all-time favourite Count Me In memories!" History of Mississauga Count Me In: "Councillor Ron Starr spoke to a conference that was organized by teenagers called Count Me In at the Living Arts Centre." (Re: April 17, 2012 Count Me In Annual Conference held in Mississauga). ~ From City of Mississauga, Council Meeting Minutes, May 2, 2012. Council Chamber, 2nd Floor, Civic Centre, 300 City Centre Drive, Mississauga, Ontario L5B 3C1. Mayor Hazel McCallion (Arrived at 9:16 am). Mayor Hazel McCallion of Mississauga. YouTube video, 1:21 min. Videotaped by I Lee at Port Credit Residences, Retirement Living by the Lake, in Mississauga ON Canada. Children from Riverside Public School Choir sing "Happy Birthday Dear Mayor" on her 91st birthday on Valentine's Day, February 14, 2012. Mayor Hazel McCallion's impromptu speech on her 91st birthday. YouTube video, 3:00 min. Uploaded on Feb 16, 2012 by sq1oac2. 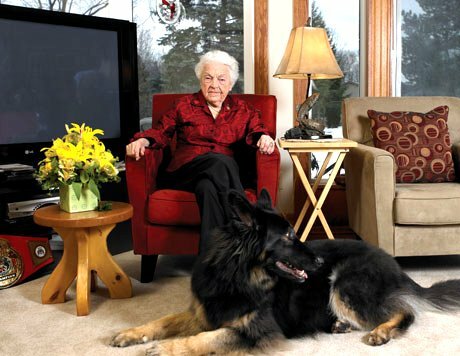 Linda Tittel to 'Hurricane Hazel': "You are a true inspiration to any one at any age." 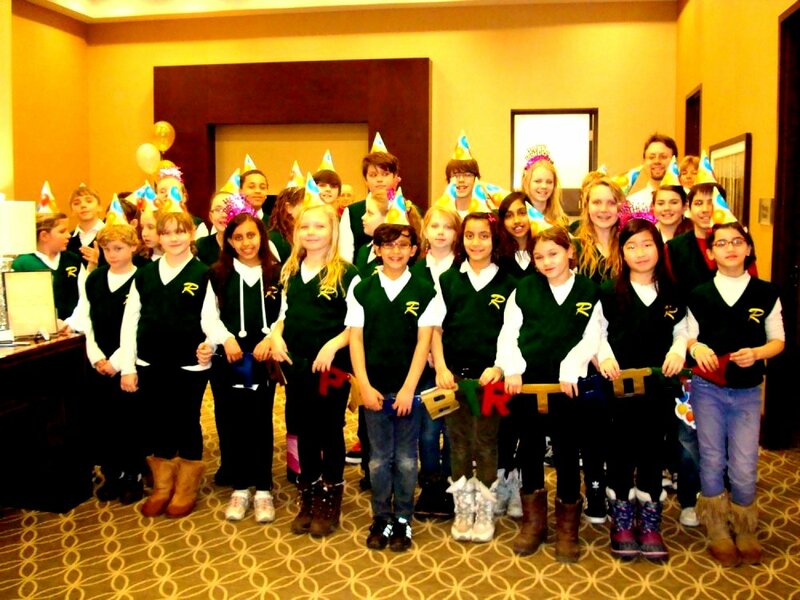 Mayor's birthday celebration held at Port Credit Retirement Residences on 14 February 2012. 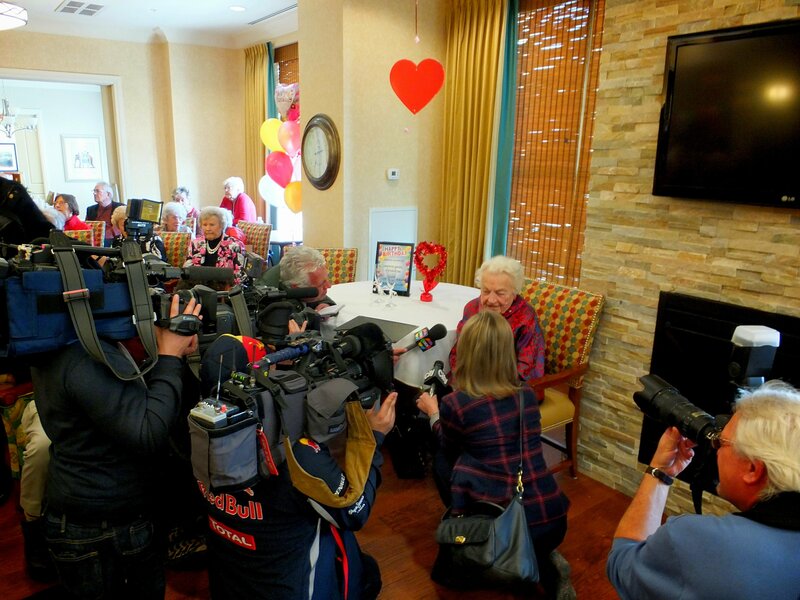 Video and information from Hazel McCallion marks Valentine's Day with 91st birthday by Erin Criger and Ashleigh Smollet, CityNews.ca, February 14, 2012. "Hurricane" Hazel McCallion turns 91 years old Tuesday Video from CityTV, February 2012. "Not only is Tuesday Valentine's Day, it's also Mississauga Mayor Hazel McCallion's 91st birthday. But the mayor isn't slowing down. She says her day runs from 5:30 a.m. until 11 p.m. 'I haven't changed my agenda in any way. Unless illness affects me, I will give the citizens the full time,' she told CityNews reporter Francis D'Souza. McCallion, who has been mayor since 1978, won her 12th term in 2010, and insists this is her last turn at the helm of the city. She's been the mayor of Mississauga for 33 years and will be 94 years old at the end of the term. Under her leadership, Mississauga became the third largest city in Ontario and the sixth largest in Canada, with a population of 734,000. 2012 will mark the first year the city has to borrow money - Mississauga is set to upgrade all traffic lights to LED lights in a $38 million project. The last few years of McCallion's reign have been rocky. In 2009, a conflict of interest inquiry was launched into a land deal involving the mayor and her son. Peter McCallion, a real estate agent in a deal between World Class Developments and the city to build a high-end hotel and convention centre near Mississauga city hall, testified he wasn't aware he was a part owner of WCD. He stood to benefit financially from the $14.4-million plan. In the end, an inquiry found McCallion intervened in the land deal on numerous occasions, including after the co-owners terminated the deal. The Mayor attempted to have the litigation settled. The last couple of years have been very difficult because of the controversy in the city ... I regret in the regard that it turned out the way it did, but all I did was assist in getting the land sold ... That was the only role I did. That didn't mean it was going to get approved by the city,' said McCallion. But despite the scandal, McCallion recently topped a list of Canada's most popular mayors with a 78 per cent approval rating." 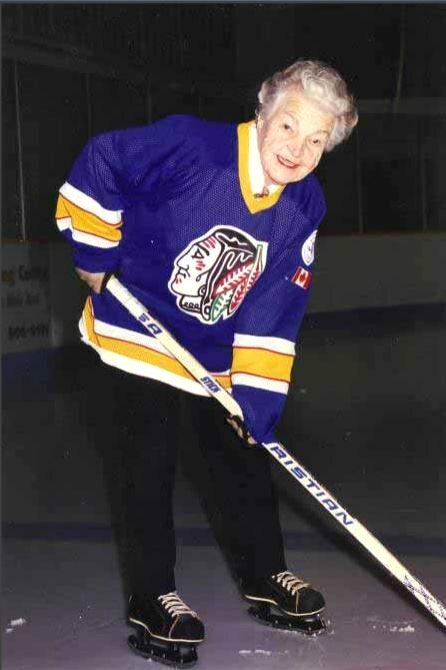 Canadian women's ice hockey history: Hazel McCallion from Wikipedia. 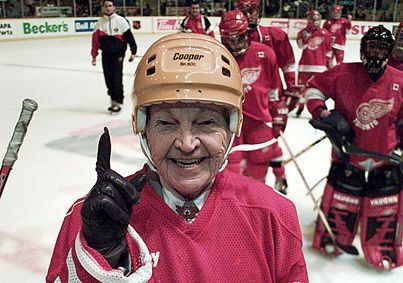 "Hazel McCallion is well known in Canada for her love of hockey. She played for a professional women's team while attending school in Montreal ... She played with her two sisters and was a forward on their team. 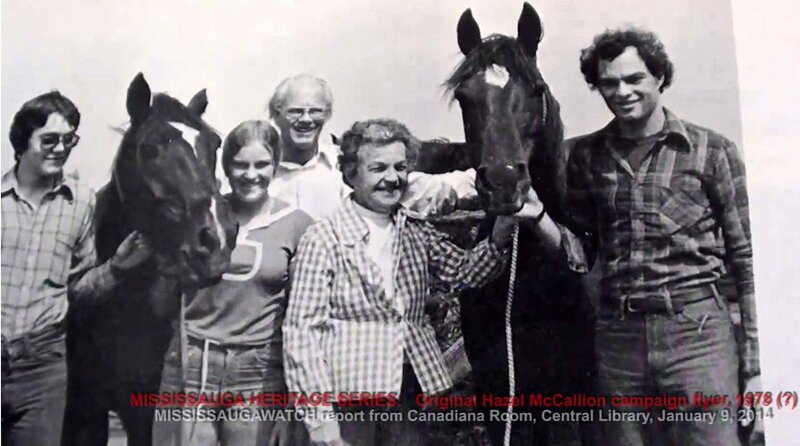 McCallion later played hockey for $5 a game in the city of Montreal ... she was a board member of the Ontario Women's Hockey League, and was instrumental in getting the Hershey Centre built for the city of Mississauga. McCallion provided assistance for Don Cherry's group to bring an Ontario Hockey League franchise to the city in 1998, and she was instrumental in bringing the IIHF Women's World Hockey Championships to the city in 2000." Third Time Lucky? 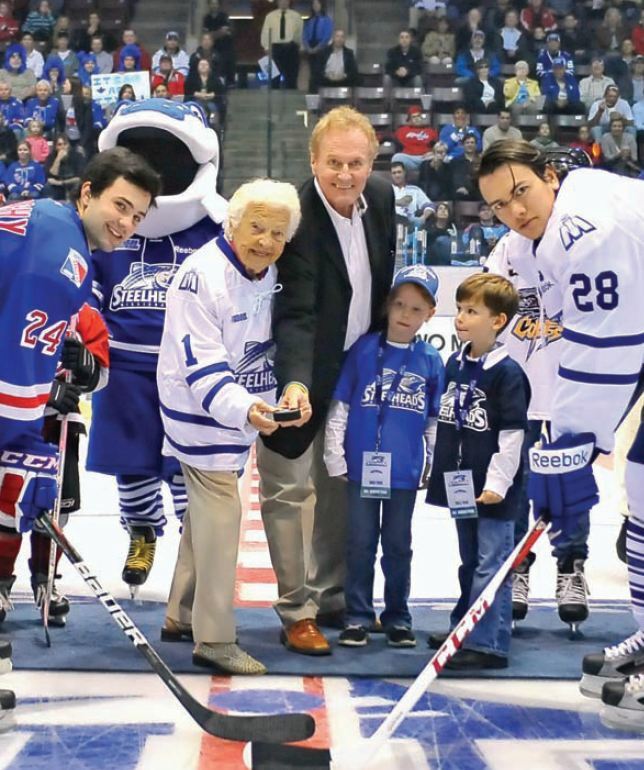 "Kitchener Rangers' Ryan Murphy, Mayor Hazel McCallion, Steelheads owner Elliott Kerr, Kerr's son and daughter, and captain Stuart Percy ready to launch the new franchise's first season." Above photo by Terry Wilson/OHL Images, published in Mississauga Life: Spirit of the City, November 2012. "The new Mississauga Steelheads of the Ontario Hockey League, led by owner and well-known Mississauga entrepreneur Elliott Kerr, hope to write a winning script about improved attendance, greater corporate support and community interest than its predecessors, the IceDogs and the St. Michael's Majors." Hazel McCallion and the Beach Boys. YouTube video, 2:22 min. Uploaded on Nov 22, 2011 by Ron Duquette. Hazel McCallion causing Pandemonium at the Beach Boys Concert. "On Saturday, November 19, 2011, the 25th Annual Mayor's Gala, a black tie fundraiser for the arts in Mississuga, Ontario, Canada featured the Beach Boys in Concert ... during their curtain call playing their hit 'Fun, Fun, Fun', as 800 beach balls descended from the ceiling, an exuberant 90-year old Mayor Hazel McCallion gets caught up in the excitement." Mississauga Mayor Hazel McCallion Supports Ontario Gang Investigators Association. YouTube video, 8:58 min. Uploaded on Nov 18, 2011 by NoToGangs.org. City of Mississauga Mayor Hazel McCallion addresses 330 delegates of law enforcement at the 10th Annual Gang and Organized Crime Professional Development Conference November 17, 2011 in support of Ontario Gang Investigators Association at Delta Meadowvale Hotel, Mississauga, Ontario Canada. On Hazel's Watch. Words by Mike Douglas, Mississauga Life, Spirit of the City. "It's the day after the latest provincial election (held on October 6, 2011), and I've got Mayor Hazel McCallion on the phone. I [Mike Douglas] was interested in her reaction to the election, voters' concerns, and her insights as to the impact the results might have on our city. 'The increasing cost of hydro and the burden of HST were the issues I heard from constituents in coffee shops around Mississauga,' says McCallion. 'People are concerned about the huge hydro debt. We, as a city, have got to deal with debt ... Property tax is our (municipality's) only source of revenue and is intended for the care and keeping of property, not for other needs.' On Hazel's watch, political support will be given to the premier for as long as his actions benefit municipalities." The fish that didn't get away from McCallion by Joe Warmington, Toronto Sun, August 11, 2011. "Yes, that was Mississauga Mayor Hazel McCallion walking in through Nathan Phillips Square and into city hall carrying a 18-pound salmon as a gift for Mayor Rob Ford ... It was quite a scene inside the mayor's office when the visiting mayor brought in her prize and the media jumped to snare the good-news story and councillors, including Doug Ford, Mike Del Grande and Frances Frances Nunziata came into to see the fish, and to meet the gracious McCallion. It was one for the books and a little bit of city hall history, too. 'Since I first went down there in 1958 for the Telegram and later for the Sun, I have seen a lot of strange things at city hall but I don't ever remember anybody bringing a salmon into the mayor's office,' former Toronto Sun editor John Downing said." FOX (Lupus of) NEWS: Mike Huckabee with Mayor Hazel McCallion -- and oh yeah, Jon Stewart. YouTube video, 2:03 min. Published on May 8, 2011 by MISSISSAUGAWATCH. "Special thanks for FOX NEWS 'Huckabee' and of course, Jon Stewart and 'The Daily Show'. Music: 'Don't Crash the Ambulance' by Mark Knopfler." Category: Comedy. Secret to Political Success: 90 Year Old Mayor Hurricane Hazel McCallion, Republican Huckabee Show. YouTube video, 6:17 min. Uploaded on May 3, 2011. Mike Huckabee show courtesy, mayor of Mississauga, legendary Hurricane Hazel, Canada, interview, politics, municipal, government, economy, healthy active living, inspiration US. True grit: "Hurricane" Hazel McCallion's last hurrah after 33 years as the mayor of Mississauga by Katrina Onstad / Photographs by Naomi Harris, Toronto Life. Published April 5, 2011. "One Saturday morning, I watch her at the Clarkson Arena, where she opens the Minor PeeWee "A" Friendship tournament. On a red carpet at the edge of the rink, a woman from the hockey association introduces McCallion: 'She'll be 90 on February 14, she's been the mayor since 1978, and she has a popularity rating of 190 per cent!'" Hazel McCallion: The Mother, The Woman, The Mayor. YouTube video: 6:07 min. Uploaded on Mar 24, 2011. Interview by Soha Dokainish for WUM Magazine. Sheridan Names New Campus in Honour of Mayor McCallion. March 17, 2011. "Sheridan College will name its new Mississauga Campus in honour of Mayor Hazel McCallion. The news was announced at a 90th birthday celebration for the Mayor held on February 12 at the Mississauga Convention Centre. In making the announcement, Sheridan President and CEO, Jeff Zabudsky, noted the tremendous impact Mayor McCallion has had on the city and the college. "It's in large part thanks to her vision and determination that we will open a brand new campus in the heart of Mississauga's city centre this fall," he said. The Hazel McCallion Campus of Sheridan College will open its doors in September in the City Centre." 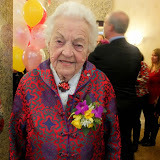 Mayor Hazel McCallion's 90th Birthday -- Lorna Dueck - 1/2. YouTube video, 8:29 min. Uploaded on Feb 24, 2011. Ron Mainse speaks with Lorna Dueck about Mayor Hazel McCallion's 90th Birthday as well as other stories she is focusing on as Executive Producer & Host of Listen Up TV. ; http://www.listenuptv.com ; Facebook: Lorna Dueck. Mayor McCallion gets flash mobbed. Article by Katherine Luczynski on February 14, 2011. "On February 9, UTM students, faculty, and staff gathered in the lobby outside the RAWC to surprise the mayor of Mississauga, Hazel McCallion, with a birthday surprise. 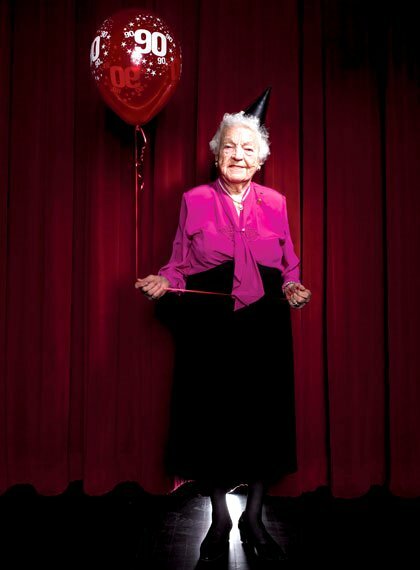 McCallion, who was born in Port Daniel, Qué bec in 1921, celebrates her 90th birthday on February 14." 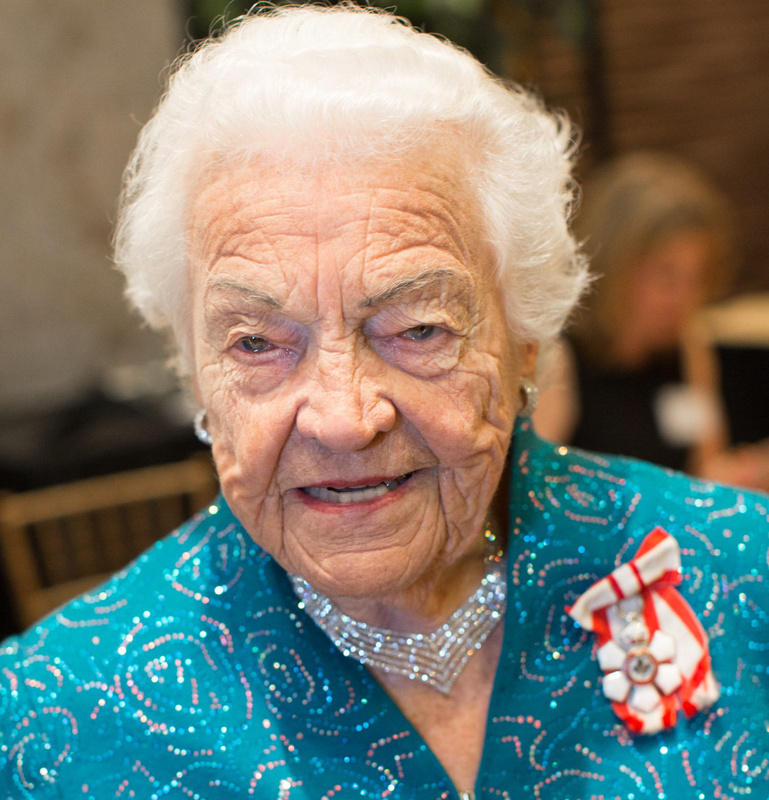 Sheridan names new campus in honour of Mayor McCallion. News release 13 Feb 2011. "Sheridan College will name its new Mississauga Campus in honour of Mayor Hazel McCallion. The news was announced last night [13 Feb 2011] by Sheridan President and CEO, Jeff Zabudsky, at a 90th birthday celebration for McCallion held at the Mississauga Convention Centre." "In making the announcement, Dr. Zabudsky noted the tremendous impact Mayor McCallion has had on the city, and the college. 'It's in large part thanks to her vision and determination that we will open a brand new campus in the heart of Mississauga's city centre this fall," he said. The Hazel McCallion Campus of Sheridan College will open its doors in September . Located at 4180 Duke of York Boulevard, the campus will offer postsecondary and postgraduate business programs, as well as programs and services for newcomers to Canada." Hazel McCallion oversaw Mississauga's transformation from rural to urban by Katie Daubs, Staff Reporter, Toronto Star, February 12, 2011. 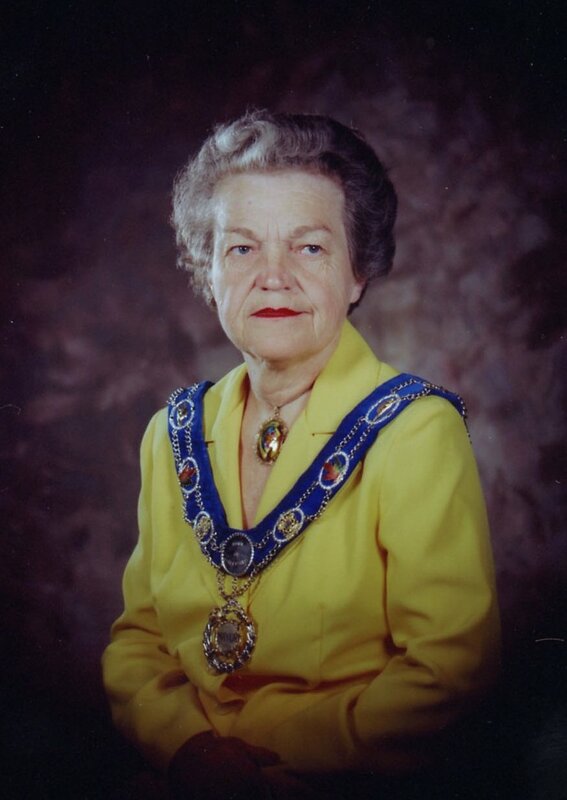 "By the time she became mayor of the fledgling city of Mississauga in 1978 ... it would be McCallion who would steer their transformation into a metropolis ... After three decades at the helm, the greatest mark McCallion would leave on the city ... would be herself." Hazel McCallion Through the Years from insauga.com. 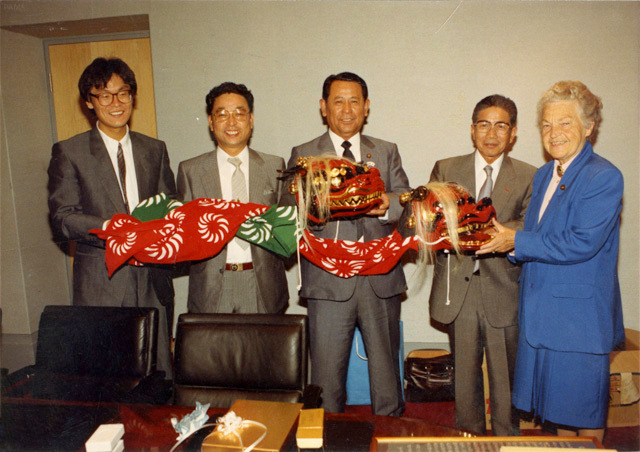 "Hazel McCallion, Mississauga's larger-than-life mayor for 36 years, was first elected Mayor in November 1978. She was acclaimed in 1980, re-elected in 1982 and 1985, acclaimed again in 1988 and re-elected in 1991, 1994, 1997, 2000, 2003, 2006 and 2010. 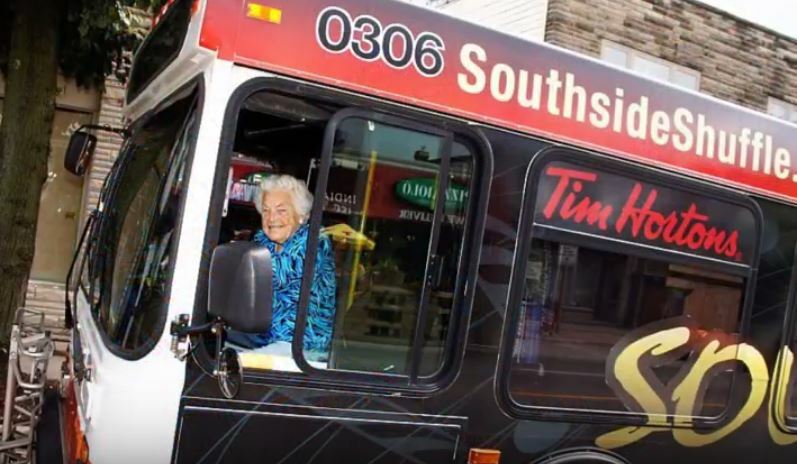 Mayor McCallion retired from office in November 2014." Birthday surprise for Mississauga Mayor Hazel McCallion at the University of Toronto Mississauga. YouTube video, 5:01 min. "On February 9, 2011, amidst a huge crowd, the U of T Mississauga Choir performed Baba Yetu as a surprise for Mississauga Mayor Hazel McCallion's 90th birthday. The song is from composer Christopher Tin's classical/world fusion album 'Calling All Dawns', which has been nominated for two Grammys. The lyrics are in Swahili, one of the official languages of Tanzania, where 'Hazel's Hope' - an initiative through World Vision Canada - helps children affected by HIV/AIDS." Birthday surprise for Mississauga Mayor Hazel McCallion at the University of Toronto Mississauga. YouTube video, 5:01 min. Uploaded on Feb 11, 2011. On February 9, 2011, amidst a huge crowd, the U of T Mississauga Choir performed Baba Yetu as a surprise for Mississauga Mayor Hazel McCallion's 90th birthday. The song is from composer Christopher Tin's classical/world fusion album 'Calling All Dawns', which has been nominated for two Grammys. The lyrics are in Swahili, one of the official languages of Tanzania, where "Hazel's Hope"--an initiative through World Vision Canada--helps children affected by HIV/AIDS. (http://www.christophertin.com/) (www.utm.utoronto.ca) (/www.utmtv.ca/). Mississauga Mayor Hazel McCallion on CNN. YouTube video, 3:57min. Uploaded on Jan 11, 2011. While in town for the June 26-27 2010 G20 summit, Toronto-raised CNN host Ali Velshi profiled Her Worship Hazel McCallion of neighbouring Mississauga, the longest-serving mayor in North America, and one of the longest worldwide. 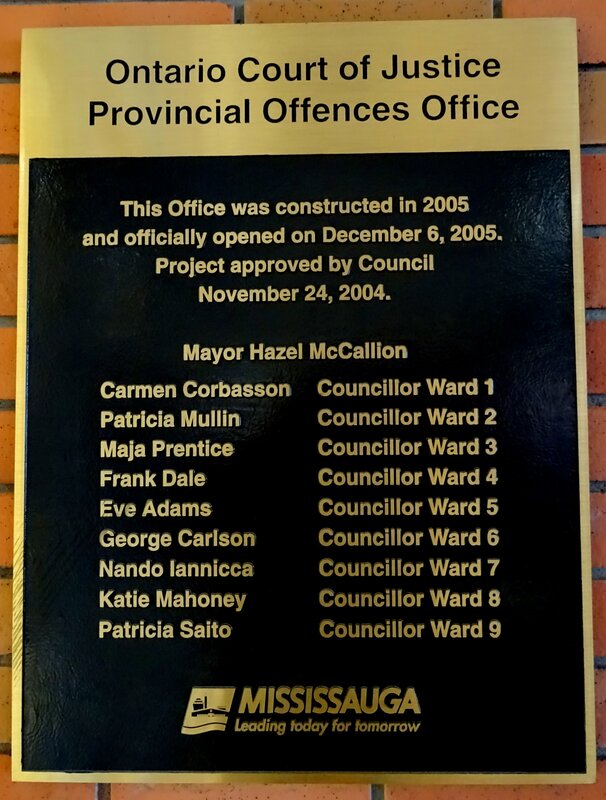 Mississauga until recently was one of the only debt-free cities in North America, due largely to the efforts of Hazel. Noel Ryan Auditorium, Mississauga Central Library. Photo by I Lee, 21 Sep 2010. Timeline: Life of a legend by Michael Posner, The Globe and Mail. Published Sep. 09, 2010. Last updated Aug. 23, 2012. 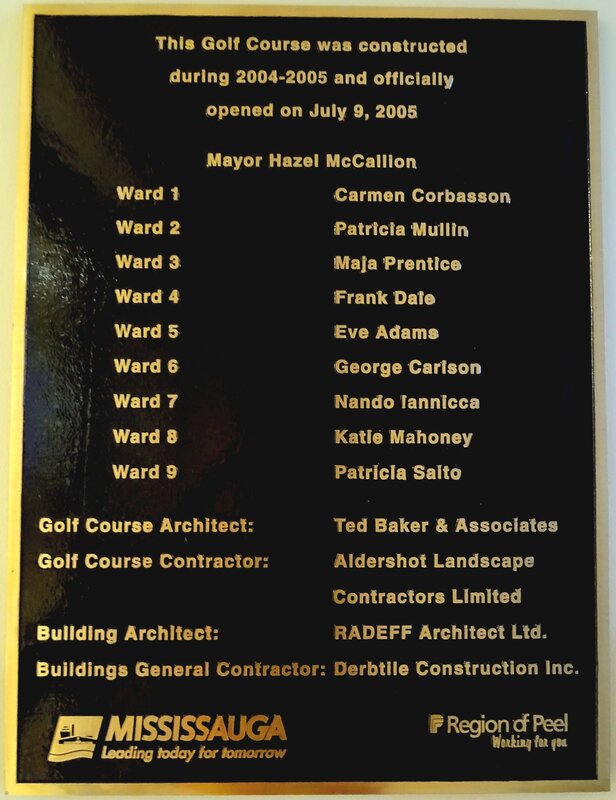 2005: Ms. McCallion ranks second in an international mayor poll, behind only Dora Bakoyannis of Athens ..."
Hazel McCallion: Hurricane Hazel will run for re-election one last time by Adrian Morrow, The Globe and Mail. Published Sep. 08, 2010. Last updated Aug. 23, 2012. "... At a raucous afternoon press conference that had the feel of a campaign rally, the octogenarian mayor's supporters packed the front room of the Kinsmen Hall in Streetsville, erupting in cheers as she strode in, greeted the media and announced that she would seek a 12th and final term on Oct. 25 ..."
Mississauga Mayor Hazel McCallion Speech Part I at Amacon Mississauga Rotary Ribfest 16 July 2010. YouTube video, 0:39 min. Mississauga Mayor Hazel McCallion Speech Part II at Amacon Mississauga Rotary Ribfest 16 July 2010. YouTube video, 1:00 min. Original videos by sq1oac, also republished by Rotary District 7080, Dec 9, 2010. Hazel mccallion quotes - an album on Flickr. Quotes from Hazel McCallion, verifiable on either videotape or audio. Another Feather for Her Cap. 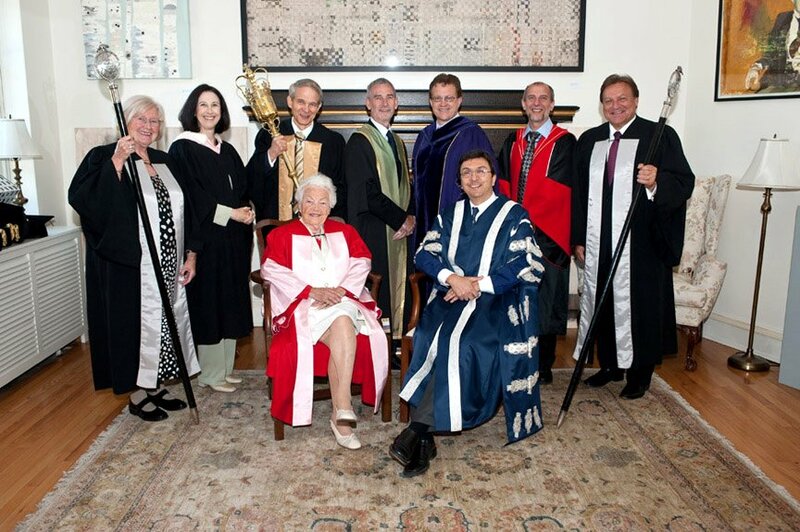 U of T awards Mississauga mayor Hazel McCallion an honorary degree, by Staff. Summer 2010. Her Worship Hazel McCallion - Honorary Degree Ceremony. Includes photos. Order of Ceremony includes: "The Chancellor will confer the degree of Doctor of Laws (LL.D. ), honoris causa, upon: HAZEL MCCALLION who will be hooded by Professor Ulli Krull, Vice-Principal, Research, University of Toronto Mississauga. Address: Dr. Hazel McCallion will address Convocation." Mayor Hazel McCallion to receive honorary degree from University of Toronto. Posted on June 2, 2010. TORONTO, ON. - "The University of Toronto will honour Mayor Hazel McCallion, Mississauga's longest serving Mayor, on Monday, June 7, 2010 at 9:30 a.m. with an honorary doctor of laws (LL.D.) in recognition of her remarkable contributions to public life. 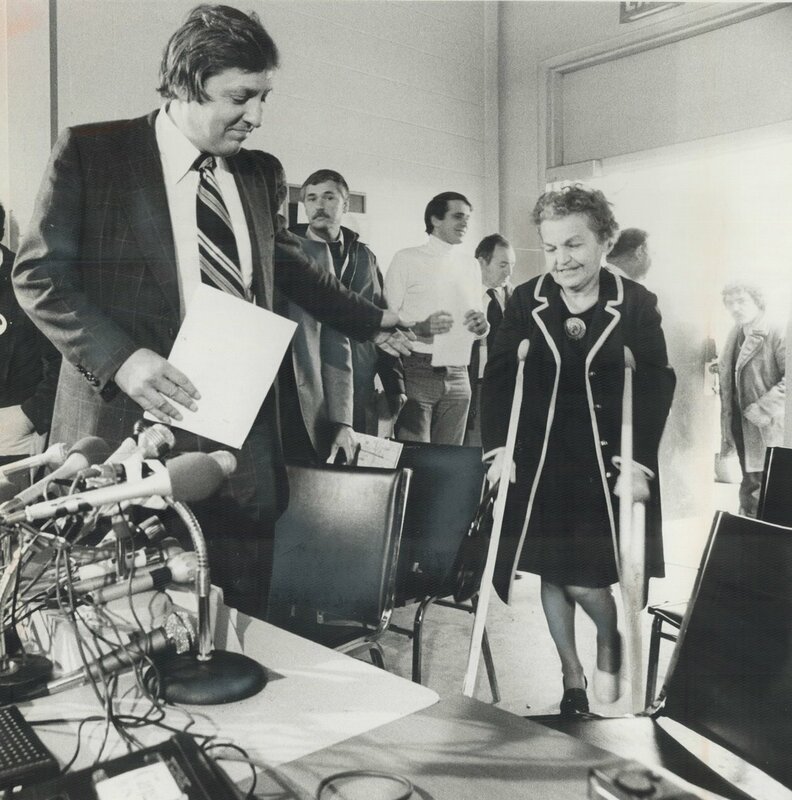 Hazel McCallion was first elected Mayor of Mississauga in November 1978, and has served as Mayor for more than 32 years. During that time, she has led the transformation of the erstwhile suburbs and small towns on the outskirts of Toronto into Mississauga, Canada's 6th largest city. Under the Mayor's guidance, Mississauga has been praised for its strong economy, thriving multiculturalism, and excellent recreational, cultural, and educational facilities. Her achievements have brought the Mayor and her city international acclaim and she is past chair the World Health Organization's Symposiums on Healthy Cities. 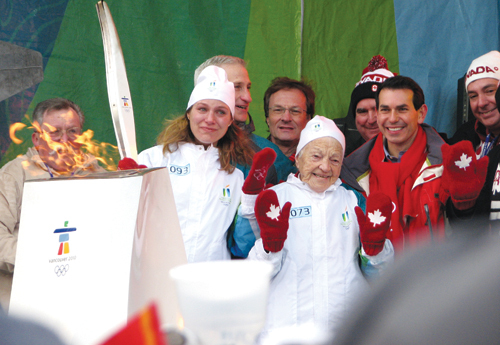 At the age of 89, Hazel McCallion continues to inspire and motivate. She is a tireless supporter of World Vision through her 'Hazel's Hope' charity for children affected by HIV/AIDS in Africa." Business Leaders Honoured at Gala. Best in the business. The Mississauga Board of Trade honoured outgoing Chair Ellen McGregor and Mayor Hazel McCallion at last night's gala at the Mississauga Convention Centre, April 15, 2010. Here [photo], Chair Syd Martin (left) and MBOT President CEO Sheldon Leiba made the presentations. "... the MBOT also presented a Lifetime Business Achievement Award to Mayor Hazel McCallion. 'The city is a corporation and the city has been debt-free year after year after year ... it's the envy of any CEO,' said McGregor, referring to the business example McCallion has set as mayor. During the past year, McCallion has helped businesses survive the recession by rallying support and awareness from provincial and federal government, and by establishing a series of meetings to address the concerns of businesses in Mississauga. During her acceptance speech, McCallion challenged businesses to hire at least two high school or university students to combat the rising unemployment rates among young adults. 'It's so important to put our young people to work and give them some hope for the future,' said McCallion." McCallion lends voice to peace by Radhika Panjwani, Mississauga News, 16 Feb 2010. "Peace has to start with each individual, as well as the community before it spreads throughout the world," said McCallion. "I would be happy to join Mayors for Peace because this is what we pray for and hope for." MBOT to honour McCallion by Louie Rosella, Mississauga News. "Mississauga Board of Trade (MBOT) will go green at its 2010 Chair's Gala, taking place April 15 at Mississauga Convention Centre ... The gala will also mark the second presentation of the board's Lifetime Business Achievement Award to Mayor Hazel McCallion." Winery honours Hazel McCallion with private labels by John Stewart, Mississauga News, Feb. 4, 2010. "Hazel McCallion, who has a rose, a university library and an elementary school named for her, will be immortalized on two new private-label wines being released later this month by Joseph's Estates Winery in Niagara-on-the-Lake. On Feb. 18, McCallion will be at the winery for a 'meet and greet' to launch the wines, whose labels are illustrated with her bobblehead personas. One label features McCallion as a hockey player, the other as an angler. There will be one red and one white, both blends, under the McCallion corks. The red will combine three VQA (Vintage Quality Alliance) grapes, while the white will feature two VQA wines. The actual grapes in the blends will be a political secret, since the Joseph's winemaker has requested they be known only to McCallion." 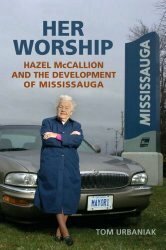 Her Worship: Hazel McCallion and the Development of Mississauga by Tom Urbaniak. This is a preview of the book published by University of Toronto Press in 2009, with limited pages displayed here. Witnessing History. Posted on 23 December 2009 by Saptarsi Saha, South Asian Generation Next (sagennext.com). "Cheryl Pounder ... has played on Canada's 1994, 1999, 2000, 2001, 2004 and 2005 World Championship Hockey teams and was voted the top defenceman at the 2002, 2004, 2007 and MVP at the 2005 Canadian Women's Hockey National Championship. Pounder's greatest career accomplishments are represented by her two Olympic Gold Medals in Salt Lake City and Torino. With tears in her eyes, Ms. Pounder told the crowd that carrying the torch 'is very, very emotional.' The Honourable Minister of Labour, Peter Fonseca, told the crowd that the highlight of the event was today's gathering where people had gathered to welcome the Olympics torch. 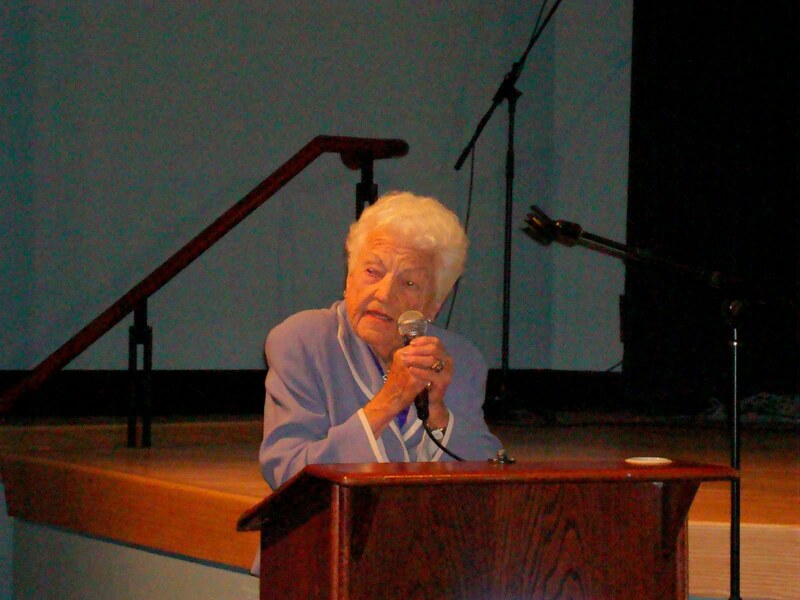 Mayor McCallion is indeed 'Hurricane Hazel.' Her voice roared as always ... Among the other elected provincial and federal legislators, she was the most recognized and the most cheered one by the crowd." Photos by I Lee, 27 Sep 2016. 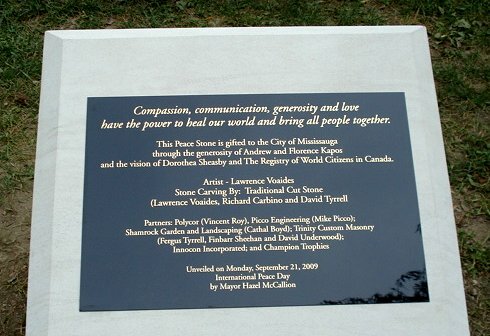 Peace stone unveiling emotional by Julie Slack, Mississauga News, 21 Sep 2009. 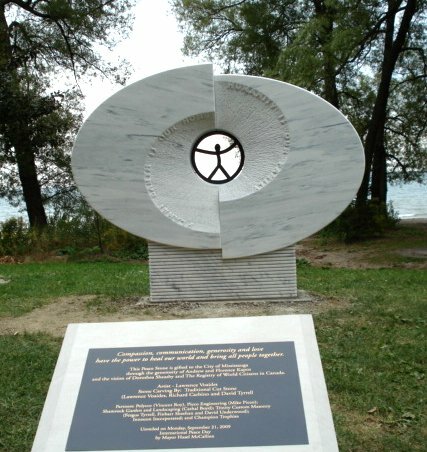 "A new Peace Stone monument was unveiled Monday - International Peace Day - in Richard's Memorial Park. In an emotional unveiling this morning, a Mississauga woman who worked tirelessly to have a peace stone erected in the city saw her dream come true. Photo by I Lee, 27 Sep 2016. Hazel McCallion. YouTube video, 6:06 min. Equal Voice - Experiences. Uploaded on Aug 12, 2009. For more information about Mohawk Park Tennis Club July 12, 2009 Reopening event, see: Tennis club back in the swing - Tennis anyone? Staff photo (of Hazel playing tennis) by Daniel Ho, published in Mississauga News, Jul 13, 2009. 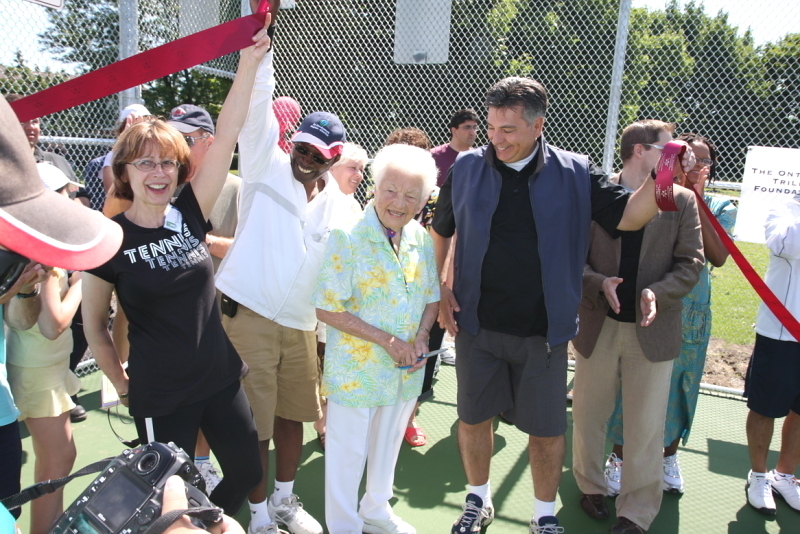 "Mayor Hazel McCallion plays a round of tennis during the grand opening of the Mohawk Park Tennis Club's refurbished court yesterday. The Ontario Trillium Foundation contributed $119,700 to the cause with the City picking up the tab for the fence and the new walkway leading to the court." The courts are located at 2409 Delkus Cres., south of The Queensway E. and west of Cawthra Rd. in Mississauga. The new court is expected to last 20 years. Mohawk Park Tennis Club also provides instructional programs for people wanting to improve their game and promote a healthier lifestyle through active living, a goal shared by many of the speakers in attendance at Sunday's opening. "This is what it's all about - health, wellness and being able to stay active," said Mississauga South MPP Charles Sousa. City officials were impressed with the plan submitted by the club's fundraising committee, and their drive to accomplish their goal, said Mayor Hazel McCallion. Residents need to take charge and support initiatives and community projects as well, she continued. "The community has a major role to play," said McCallion. "You've shown us ... that you have the drive to make this happen." Mayor Hazel McCallion, "Doctor of Hearts"
15 Million Ways to Say "I Heart Hazel". News Release, Mississauga ON, 26 Jun 2009. "Million dollar bequest helps Trillium Health Centre Foundation successfully complete campaign in support of the Hazel McCallion Centre for Heart Health. Trillium Health Centre Foundation today announced that thanks to a community effort, led by ten Cardiac Champions, its campaign to raise $15 million to support local cardiac care has met its goal. A surprise million dollar bequest from a long-time supporter of the Health Centre capped off the effort that began 15 months ago by community leader and philanthropist Fred Ketchen who pledged the first million. 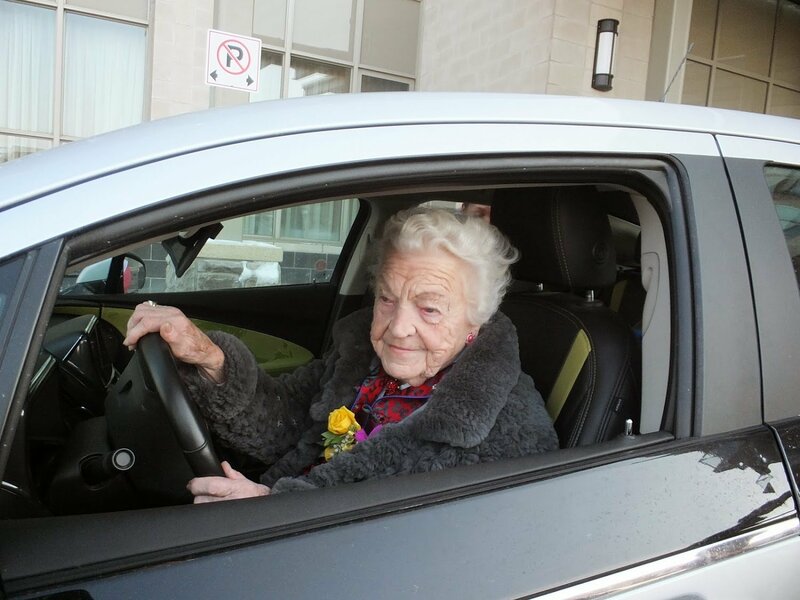 The "I Heart Hazel" campaign challenged the community to demonstrate their love, appreciation and respect for Mayor McCallion by making a donation in her honour to the Hazel McCallion Centre for Heart Health at Trillium. "Generosity and community spirit have always been hallmarks of our community. How proud I am to see our citizens once again donate with open hearts to create a lasting legacy to serve the people of Mississauga, west Toronto and surrounding communities - the Hazel McCallion Centre for Heart Health at Trillium Health Centre! Despite the challenging economic times the community, led by a group of home-grown and home-proud Cardiac Champions, helped us to realize our goal of raising $15 million to advance cardiac diagnostics, treatment, surgery and rehabilitation right here at home. As an honorary 'Doctor of Hearts', I thank you from the bottom of mine for helping us to succeed. ~ Mayor Hazel McCallion." RMR: Welcome to Mississauga. Out and about in the City of Mississauga with Mayor Hazel McCallion. YouTube video, 6:31 min. Uploaded on Feb 26, 2009 by Rick Mercer Report. Rick Mercer asks the 88 year old mayor, "You have outlasted 8 prime ministers ... Why haven't you retired? ... Hazel, what's your approval rating? Answer: 92% of the vote." TheStar.com talks to Mississauga mayor Hazel McCallion. YouTube video: 3:30 min. Uploaded on Dec 31, 2008. In a year-end interview, Mississauga mayor Hazel McCallion talks candidly about her successes, her failures and her plans for the future. Check thestar.com for more news and information. Mayor Hazel "The Hurricane" McCallion. YouTube video, 0:48 min. Uploaded on Nov 28, 2008 by Digital Dream Photo, Video, DJ & Photo Booth. Mayor Hazel McCallion support Women's Boxing and CESBA - She's in our corner. Watch Hazel box with red gloves, for fun. Mayor McCallion Bikes to Work. YouTube video, 2:08 min. Uploaded on Sep 30, 2008. 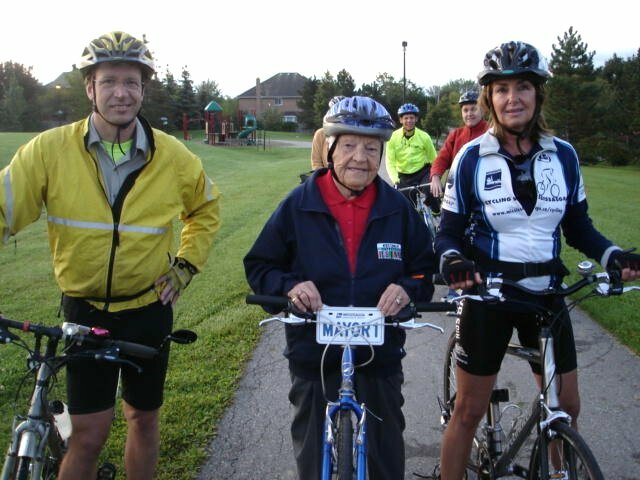 87 year old Mississauga Mayor Hazel McCallion set an example for all citizens by biking to work on International Car Free Day, September 2008. A 7km bike ride from Streetsville to City Hall. Dinner tickets available for McCallion golf event. "Most people are familiar with all the good work accomplished thanks to money raised at the Hazel McCallion Charity Golf Tournament since its inception 25 years ago ... This year's tournament tees off tomorrow [September 13, 2007] at Lionhead Golf and Country Club and there are a slew of great items up for auction. Last year's event raised in excess of $90,000. The Mississauga News' publisher Ron Lenyk will act as the official auctioneer and help bring in the bids on the items generously donated by the community." Information from Hockey Canada Honours Hazel by John Stewart, May 28, 2007. "After 80 years playing and supporting the game she loves, Mayor Hazel McCallion has been honoured for her contributions by Hockey Canada. The 86-year-old mayor accepted the Female Hockey Breakthrough Award in Winnipeg recently. "The game of hockey has come a long way since I first started playing," McCallion said after accepting the award. "Hockey Canada has done a great service in leading both men and women's hockey, and creating a positive environment for everyone to get involved." As a young woman, McCallion played regularly in female hockey leagues in Montreal. 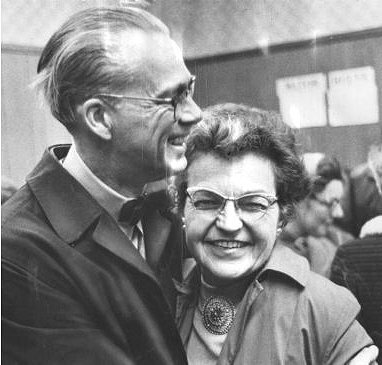 She was instrumental in having the Hershey Centre built in Mississauga and attracting an Ontario Hockey League franchise. McCallion has also been a long-time champion of women's hockey. She has maintained a quarter-century association with the Ontario Women's Hockey League and was the honourary chair of the Women's World Hockey Tournaments in 1987, 1997 and 2000. Some world championship games were played in Mississauga. Hockey Canada's Female Hockey Council recognizes an individual each year for their outstanding leadership, contribution, development and advancement of female hockey in Canada. Nominated by the branch office in Calgary, McCallion was recognized for her, 'invaluable contribution to Canada's national winter game.'" This article is for personal use only courtesy of YourOttawaRegion.com - a division of Metroland Media Group Ltd.
A rose by any other name would be - Hazel by James Rusk, The Globe and Mail, Nov 8, 2007, Updated Apr 26, 2018. 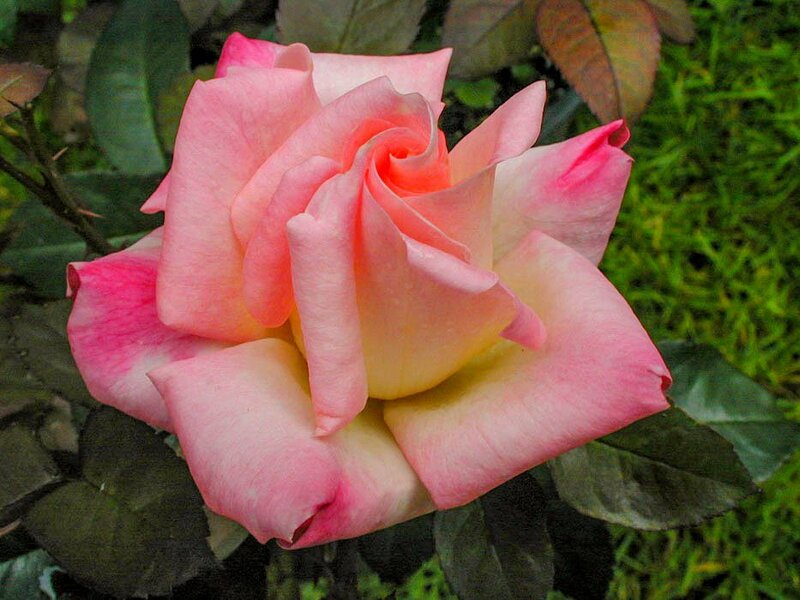 "Mississauga council decided unanimously that the Hazel McCallion rose - a pink mini-floribunda with shades of soft white on the petals and a mild fragrance - will be the city's official flower. 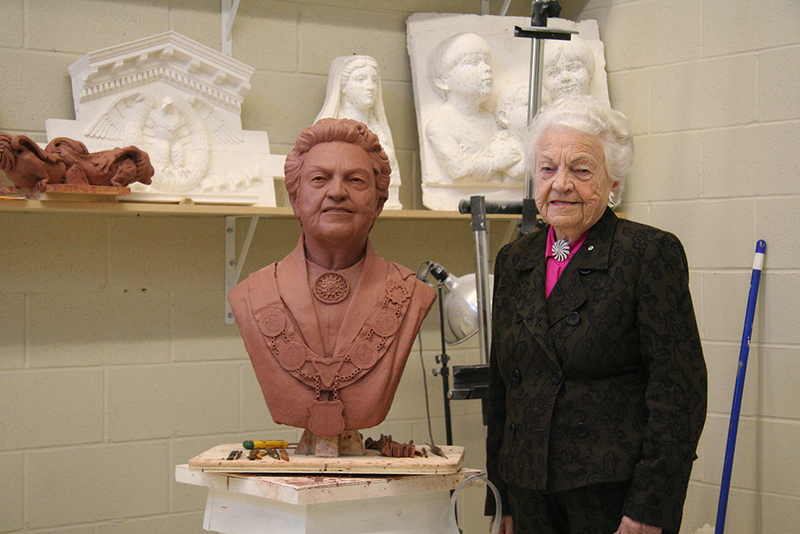 The honour was the outcome of a decision by the Mississauga Board of Trade not to follow the usual route of commissioning a painting or a statue, but to honour Ms. McCallion ... with something that would be a 'really living and lasting tribute,' board president Sheryl McKean said in an interview. She said that, after a search, the board discovered that Hortico Nurseries in Waterdown had some new, unnamed roses that were about to go into commercial production. The board picked one that it felt would be an appropriate reminder of the mayor - pink is her favourite colour and the 24-inch-high plant 'is very sturdy, very strong' - and shelled out more than $10,000 for the international naming rights. Only about 200 Hazel McCallion roses will be available next year, but it will be widely available in 2009, Ms. McKean said. It will be sold for $19.95 and the Board of Trade will get a percentage of the proceeds, which it plans to donate to Hazel's Hope, an international charity named after the mayor that supports a home in Tanzania for children with HIV-AIDS, Ms. McKean added. by Mayor Hazel McCallion, C.M. Hazel McCallion. YouTube video, 4:04 min. Uploaded on Sep 12, 2006 by Peter Wall. A profile of Hazel McCallion. Info from GolfNow.com: "The public, par 72 Championship Course features 18 challenging holes and totals 6,415 yards from the back tees. Set amongst dramatic landforms, the wind swept course features tall grasses, pristine fairways, greens and tees, with challenging pot bunkers - all reminiscent of golf's early beginnings. Borrowing from this heritage, the name of the course - 'BraeBen' - is Gaelic for 'slope' and 'mountain or hill'. The elevated playing surface ensures that wind will be a factor most days - just like the challenging conditions found in the highlands of Scotland." Hazel McCallion's Annual Charity Golf Tournament. In September 2014, Mayor Hazel McCallion thanks "Jim Holmes and his staff at Derrydale Golf Club; Credit Valley Golf and Country Club; Iggy Kaneff and Lionhead Golf and Country Club; and the staff of the City-owned BraeBen Golf and Country Club - all courses at which the tournament has been hosted throughout the years." 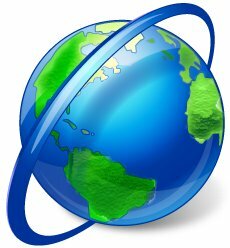 Note: Old website at hazelscharitygolf.com no longer exists, 11Aug16. The Governor General of Canada: His Excellency the Right Honourable David Johnston. Order of Canada Citation for Hazel McCallion, C.M. Mississauga, Ontario [Canada]. Member of the Order of Canada. Awarded on June 29, 2005; Invested on November 18, 2005. "Hazel McCallion's commitment and dedication to the people of Mississauga have made her one of Canada's best known and longest serving mayors. She has taken on leadership roles within many municipal government organizations, such as the Greater Toronto Area Mayors' Committee. Resolute in her commitment to improving the quality of life of her fellow citizens, she has also served as chair of the World Health Organization symposia on healthy cities. In addition, her annual charity golf tournament has helped to raise funds for a myriad of local, provincial and national organizations." Information from World Mayor: Profile of Hazel McCallion, Mayor of Mississauga, Canada by Andrew Stevens, Political Editor. Information from World Mayor: Hazel McCallion interviewed by an international audience. Question: What do you regard as your greatest achievement? Mayor McCallion replies: I have been blessed to have many achievements throughout my career but probably the one I am most proud of is having my vision of what the City would become made a reality. I had an image that Mississauga would grow from a small bedroom community into one of the most vibrant cities in our country and seeing Mississauga become the third largest city in Ontario and the sixth largest in Canada has surpassed my expectations ..."
Hazel McCallion, Mayor of Mississauga, Canada. Profile of Mayor Hazel McCallion by Andrew Stevens, Political Editor, 2005 Project. "Though a separate municipal concern, the Canadian city of Mississauga has long had to exist within the shadow of its larger neighbour Toronto and has since been absorbed into its metropolitan sprawl. It is content to regard itself as part of the Greater Toronto Area however, one of the fastest-growing regions of North America with five million inhabitants, of which 700,000 reside in Mississauga itself. Where the city is able to assert itself in regional politics is through its mayor, 'Hurricane' Hazel McCallion, who has won every mayoral election contested since 1978. Even at 84 years old she shows little sign of withdrawing from Canadian politics, gaining re-election in 2003 and receiving the Order of Canada in 2005 as well as being runner-up in World Mayor 2005. She is the longest serving mayor in Canada and has kept the city debt-free since her first term of office." Mississauga Mayor McCallion: We run our city like a business by Tann vom Hove, Editor, citymayors.com, 1 February 2004. 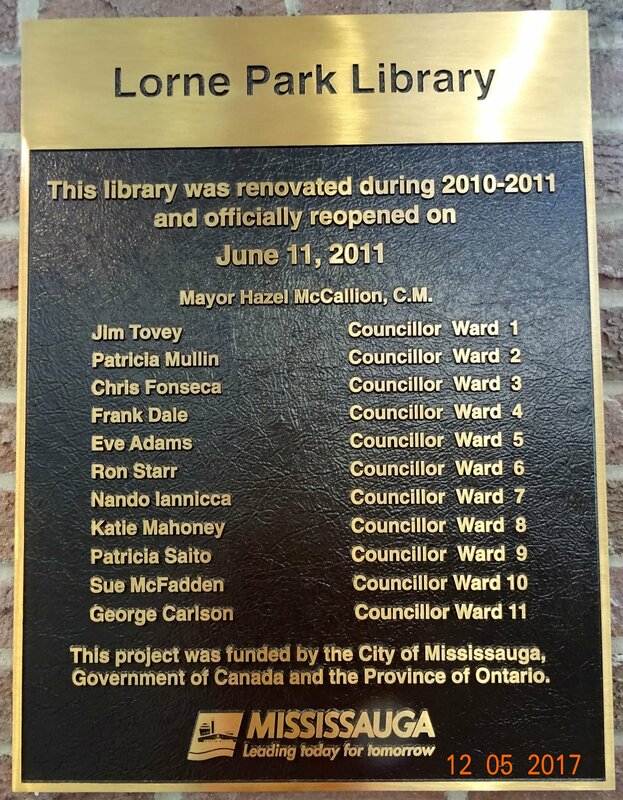 "... Hazel McCallion is a committed follower of a pay-as-you-go philosophy and, in 1991, she became the first mayor of a major Canadian city to submit an annual operating budget to its residents for their input and scrutiny. Internationally, the Mayor received Germany's Cross of the Order of Merit for her role in bringing German companies to Canada ..."
Hazel McCallion, Mayor of Mississauga. Article from citymayaors.com, 16 November 2003. 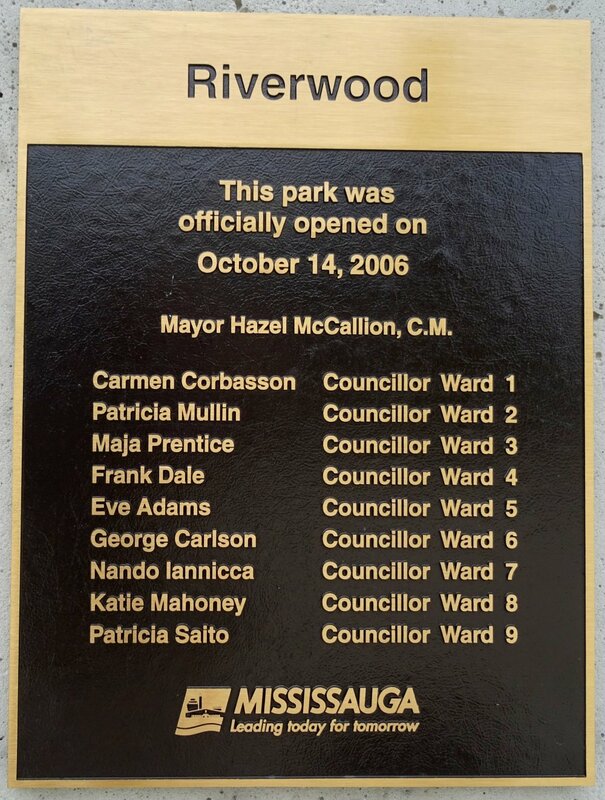 "On 11 November 2003, Hazel McCallion started her 10th term as Mayor of Mississauga, Ontario ... Mayor McCallion has played a leading role for women in politics. She is the first woman to hold such significant positions as President of the Streetsville and District Chamber of Commerce; President of the Anglican Young Peoples' Association of Canada; Mayor of Streetsville and Mayor of Mississauga. She was chosen one of the 'American Women of the Year' in Who's Who of American Women (which refers to North American women) ..."
"Mississauga Mayor Hazel McCallion began playing hockey in the late 1920s in Port Daniel on the Gaspe coast of Quebec. With her two older sisters playing defense, Hazel took her spot as a lightning quick centre on a team in a ladies' league. After moving to Montreal, McCallion turned 'professional', earning $5 a game to play for Kik Cola, one of three teams in a ladies' league there. 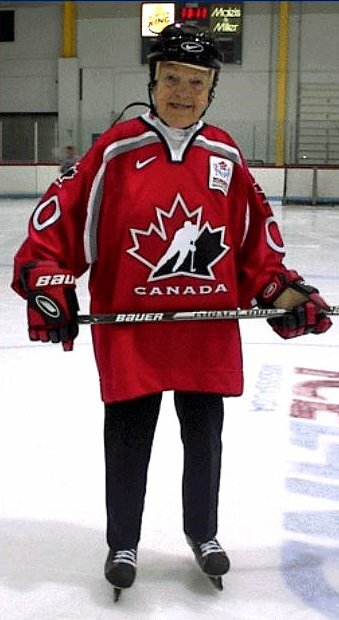 Since first being elected as mayor of Mississauga, Ontario in 1978, Hazel McCallion has been able to spread her influence into other hockey-related areas, including sitting on the board of the Ontario Women's Hockey League, obtaining ice time for girls' hockey and helping Mississauga build the Hershey Centre. 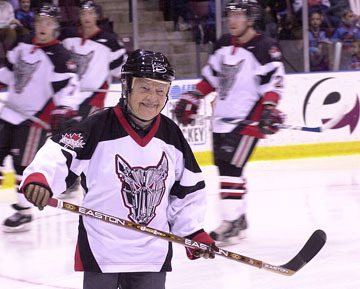 In 1998, Hazel McCallion assisted a group headed by hockey personality Don Cherry in securing a franchise for the Mississauga IceDogs in the Ontario Hockey League." Yansong Ma, founder of the MAD office, Beijing/China architectural design firm was announced as the winner. Sales were to start in May 2007 with construction beginning later that year, and anticipated completion in 2009. Within days of the announcement, the taller building had been nicknamed the "Marilyn Monroe" tower due to its curvaceous, hourglass figure likened to actress Marilyn Monroe. Burka Varacalli Architects, a Toronto firm, was hired as MAD's local partner in April 2007. On June 14, 2012, the Chicago-based Council on Tall Buildings and Urban Habitat (CTBUH), a non-profit group of architects and engineers, reported that the towers were among the world's best new skyscrapers." Condo on sale for $3.2 million by Joseph Chin, Mississauga News, Dec 19, 2011. "56th floor penthouse suite [3,401 sq.ft.] ... on sale for $3.2 million. It's a record listing price for a condo in Mississauga ... 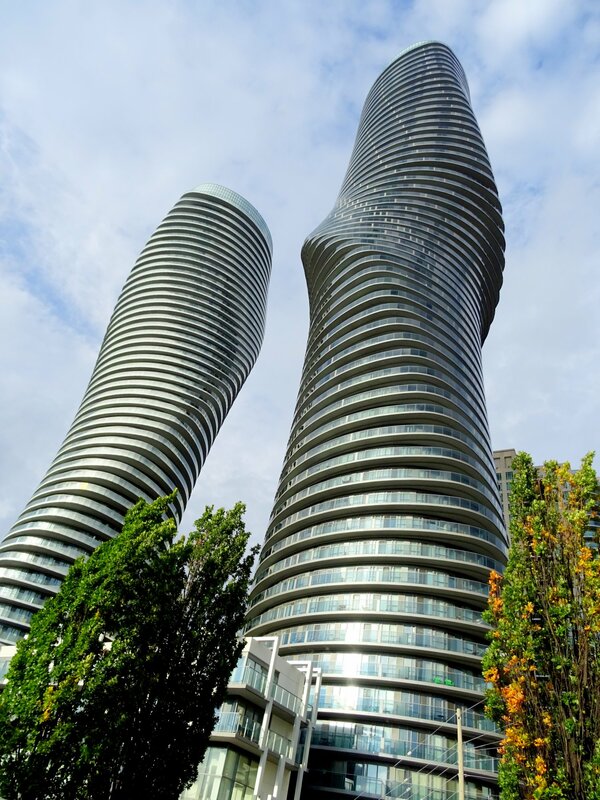 It sits at the very top of Mississauga's already iconic tower, boasts 180-degree views of the lake and the city's skyline, comes with four parking spots and priority use of the elevator ... the owner of the penthouse suite at 60 Absolute Dr., better known as the Marilyn Monroe building for its curvy shape, is putting the unit up for sale. 'It will be the most expensive condo ever sold in this city,' said Mississauga ReMax agent Sam McDadi, who's handling the transaction for the anonymous Argentinean owner." Hazel McCallion original campaign flyer 1978: From Councillor to Mayor of Mississauga. YouTube video, 3:52 min. Published on Jan 14, 2014 by Mississauga Watch. "... see the 1978 campaign flyer that Hazel McCallion and her backers used to propel her from Ward 9 Councillor to Mayor of the Town of Mississauga." 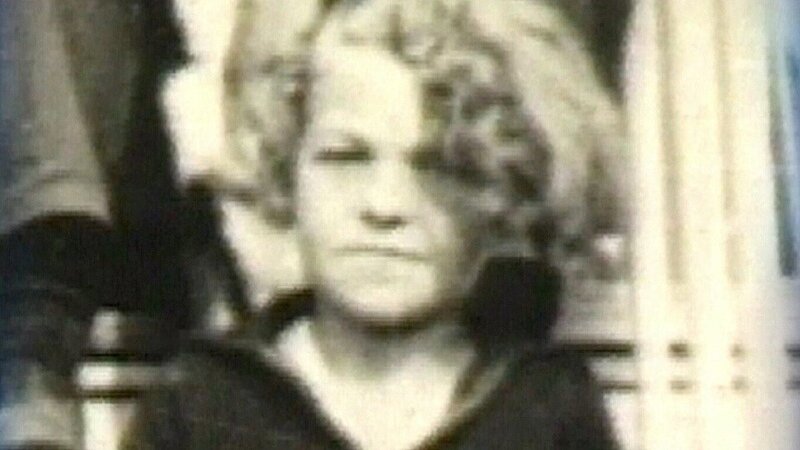 Want to know what Canada was like the year Hazel McCallion was born? New census info reveals all by Stephanie MacLennan/Torstar Network, Mississauga News, October 30, 2013. 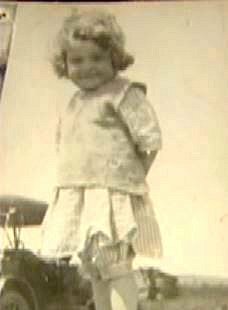 "Hazel McCallion, seen here in 1950, was born in 1921, the year of the census. The information is now available after a 92-year waiting period." Hazel McCallion, 1950, around age 29. Photo source: W5, CTV aired on 24 Oct. 2014. Photo taken circa 1928, 1929 or 1930? at age 6, 7, or 8, or older? Photo taken circa 1924 or 1925? at age 3 or 4? Hurricane Hazel from Wikipedia. "Hurricane Hazel was the deadliest and costliest hurricane of the 1954 Atlantic hurricane season." Effects of Hurricane Hazel in Canada from Wikipedia. 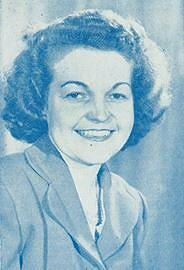 "As a whole, Hazel was very unpredictable which made it even more dangerous, as it defied meteorologists' predictions on multiple occasions ... On October 14, just before reaching the Carolinas, hurricane hunter planes found the hurricane's winds to have accelerated to 240 kilometres per hour (150 mph), making it a Category 4 storm, and it was moving at a high forward speed of 48 kilometres per hour (30 mph)." Part 1: 1954's Hurricane Hazel. YouTube video, 2:31 min. Published on May 13, 2015 by ActionNewsWBNGTV. This is the history of Hurricane Hazel in 1954. A look back at 1954 Hurricane Hazel . YouTube video, 2:18 min. Published on Oct 20, 2014 by Lauren Rautenkranz. WECT News, October 15th 2014. Hurricane Hazel (1954) at Harkers Island, NC. YouTube video, 2:22 min. Published on May 21, 2014 by Joel Hancock Sr. Home video taken by Vernon Guthrie of Harkers Island, NC showing the impact of Hurricane Hazel at Harkers Island NC in October 1954. A History of Toronto #24: Lessons from Hurricane Hazel. YouTube video, 2:40. Published on Nov 7, 2012 by Anne Martin. "In October 1954 disaster struck the Humber Valley in Toronto when Hurricane Hazel came inland 960 km from the Carolina coast. Archival film footage and old photos reveal the tragedy unfolding as 10 metres of water came down the valley trapping people in their homes and cars and sweeping them down river ..."
Weather History: Hurricane Hazel 1954. YouTube video, 1:15 min. Published on Oct 24, 2012 by HappyMario64. "In October of 1954, Hurricane Hazel contradicted all forecasts and projected trajectories resulting in over a twelve hundred fatalities, mostly in Haiti." "Hazel". YouTube video, 21:31 min. Published on Jul 17, 2012 by Jay Jennings. "The WRALDoc team looks back at Hurricane Hazel. This 1954 storm is still the standard by which all hurricanes are measured in North Carolina. Charlie Gaddy hosts. This program originally aired in October of 2004 on WRAL-TV in Raleigh, NC." Hurricane Hazel - 15 October 1954. YouTube video, 2:59 min. Uploaded on Nov 30, 2009 by aartattack. October 1954 Galt Hurricane Hazel. YouTube video, 4:00 min. Uploaded on Nov 11, 2008 by Paul Langan. "Lots of action here, cars flying around the corner through water ... Enjoy this piece of history."